Red Oak in the Highland door and warm gray “Heather” stain allows the wood grain to enhance and add texture to the kitchen. This kitchen showcases our Dura Supreme line of cabinetry in a way that thinks outside of the “white kitchen” box! Yes, a great cabinet solution when you have existing wood trim and doors is to go with a painted finish… but what about a contrasting stain instead? The kitchen image below is a great example of how this Heather gray stain allows the woodgrain to be enhanced and compliments the nearby oak door and existing oak antique hutch right next to the tall pantry cabinet. As you can see in these images from the finished kitchen, the woodgrain adds so much depth and texture to the space. Gray stain is an updated approach to an Oak kitchen. The finished kitchen has its own impact but now looks right a home with all of the other surrounding spaces as well. A small island is at the center of the U-shaped kitchen design. This provides a great landing space for the cooking and refrigerator zones and also a large work surface for a second kitchen user if another is at the sink or cooking areas. The wall tile in this kitchen remodel was another material selection that showcases natural beauty. 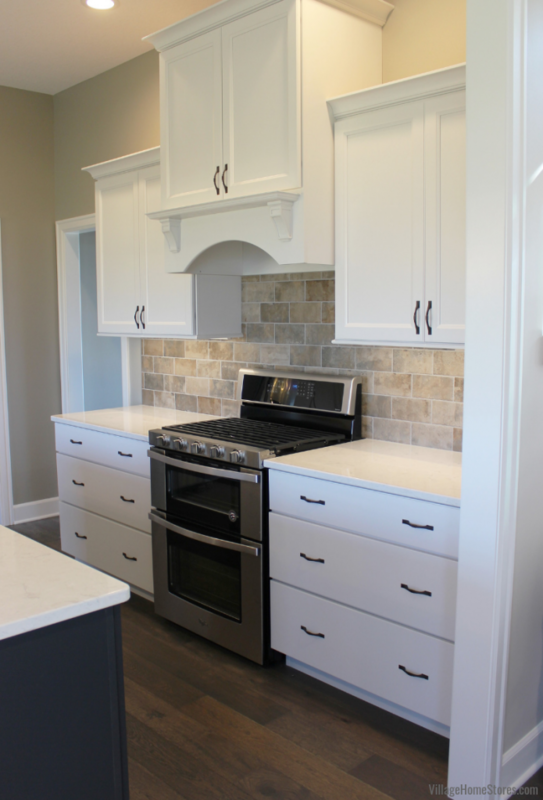 An “Arctic Gray” honed Limestone is cut and beveled into 2″x4″ tiles and each is different from the next. 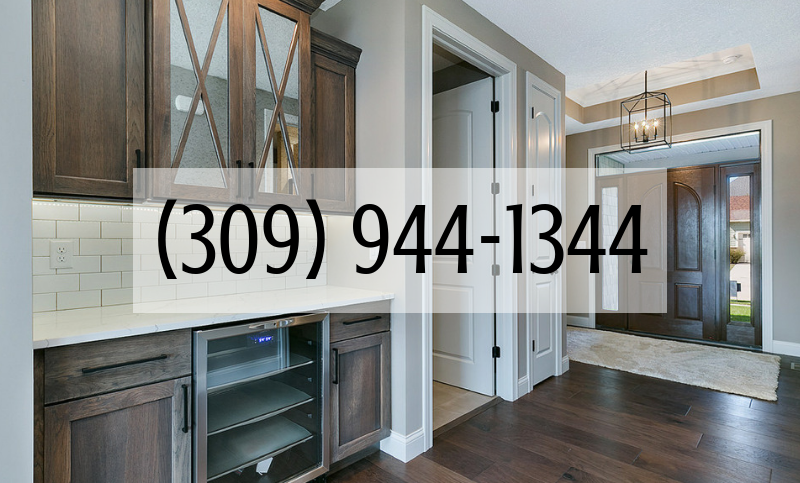 The lightest of the tiles mirrors the color of the countertops, and the darkest mirrors the color of the cabinetry stain. Our Diode LED undercabinet lighting system showcases this tile day or night. Learn more about this product here on our YouTube channel. Another silvery gray finish in the kitchen is found in the new Stainless Steel cooking suite we installed from our Viking Appliance line. Did you know that Village Home Stores is the largest Viking showroom between Chicago and Des Moines?! Offering a full line of products with many units installed and on display in kitchen vignettes in our showroom at 105 S State Geneseo, IL. 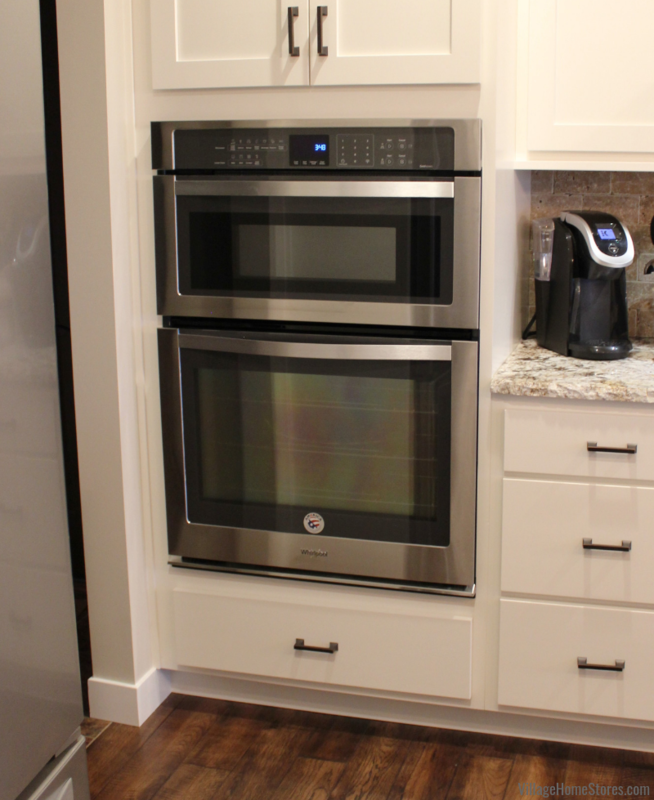 In this kitchen we included a microwave hood and freestanding gas range. This professional convection microwave hood offers the convenience of a microwave and hood all in one. The convection microwave delivers real convection cooking and the built-in ventilation system clears the air while keeping odors at bay. This Viking 3 series range includes continuous grates with 5 sealed burners beneath. High performance cooking modes include Natural Airflow Bake, Convection Bake, Broil, Convection Broil, Convection Dehydrate, and Convection Defrost. Plus it has the convenience of self-cleaning! 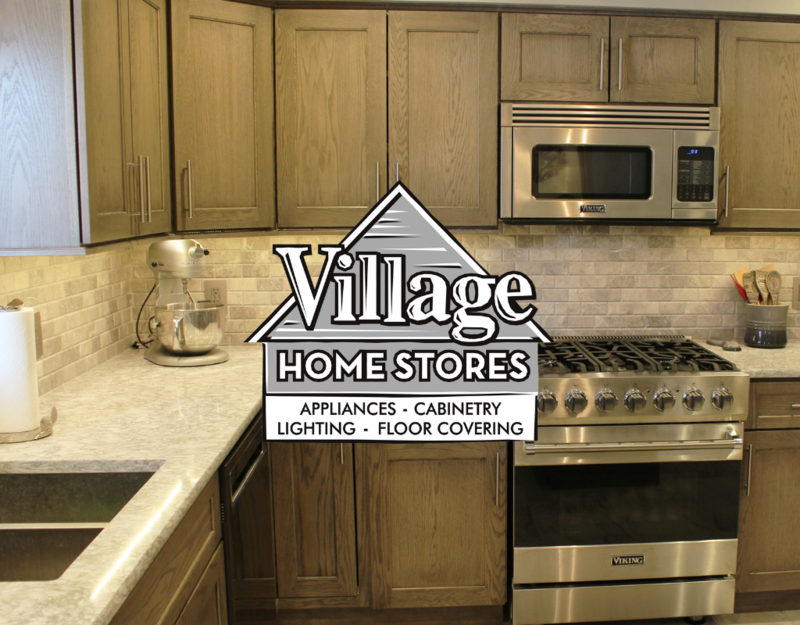 Contact an appliance expert at Village Home Stores today to learn more about our Viking appliance options. 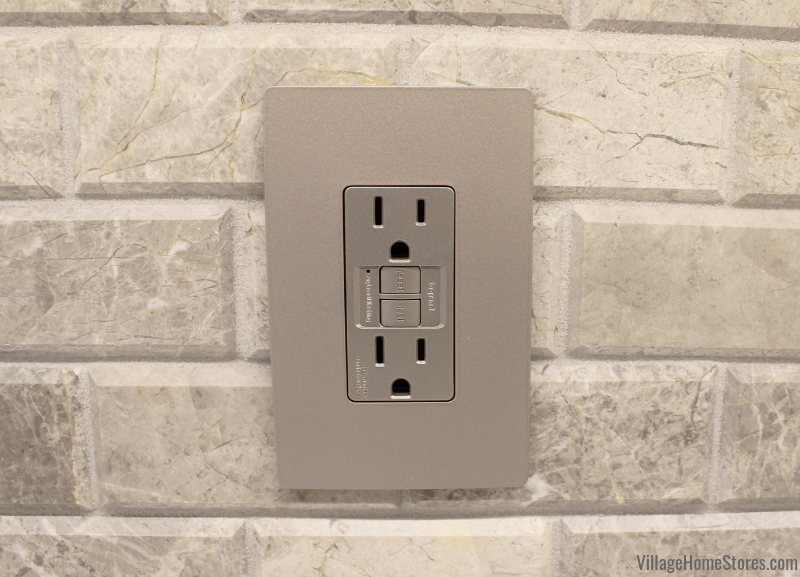 Did you know that we also offer wall switch and outlet systems in our lighting department? 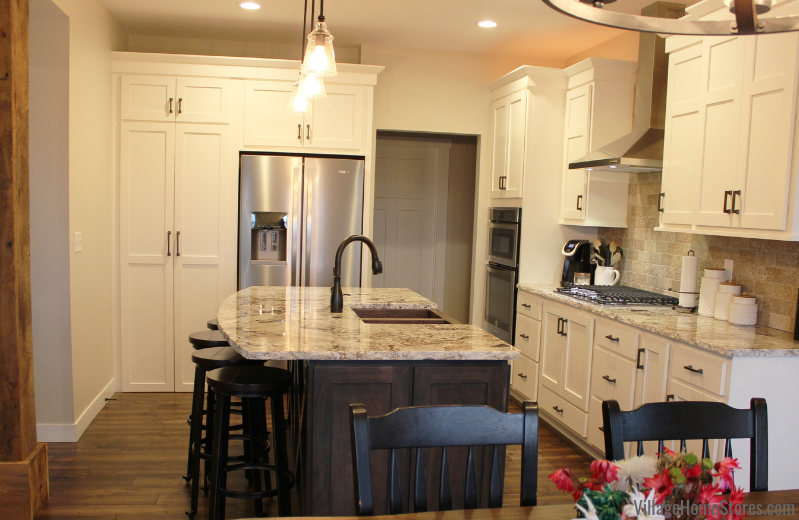 This Colona kitchen remodel features our Radiant series from Legrand in the Nickel finish. A clean, complimenting look with the rest of the kitchen finishes and no visible screws! We have a lot of our showroom set up with this product so do stop in anytime and see your options. 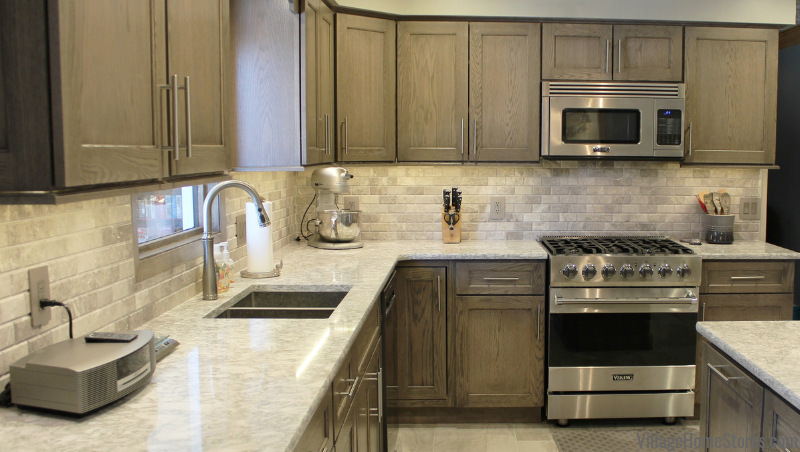 The countertop surfaces in this remodeled kitchen are from our Cambria Quartz line. The Berwyn design has been a bestseller for us for a handful of years now. It is such a winning mix of warm grays and whites that it looks fantastic in such a wide variety of completed spaces! 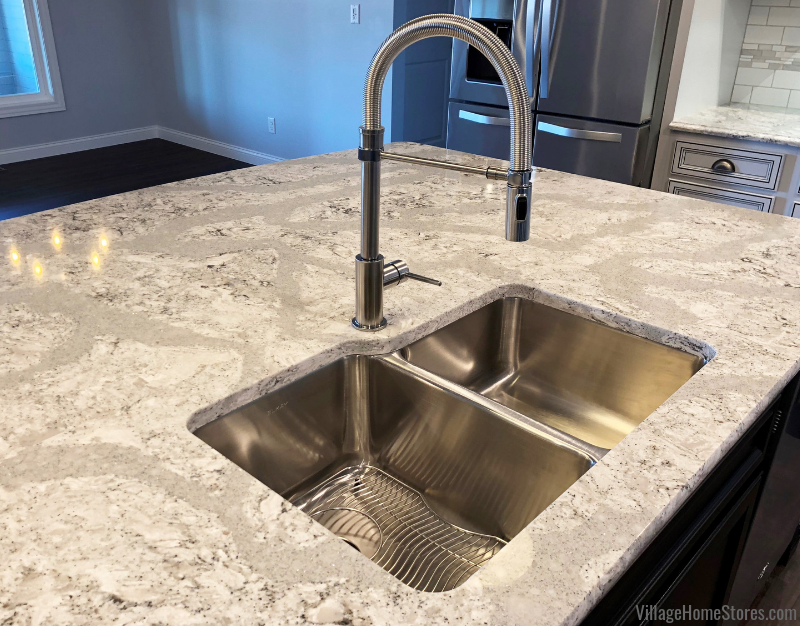 Cambria Quartz is a great surface selection for your kitchen because it is foodsafe, maintenance free, and extremely durable. See the full album of photos from this completed remodel here on our Houzz profile. We love the glass door details in this kitchen design. Dura Supreme offers many options for glass door styles and inserts. Your designer from Village will work with you to decide what style and insert material would work best for your space and lifestyle. 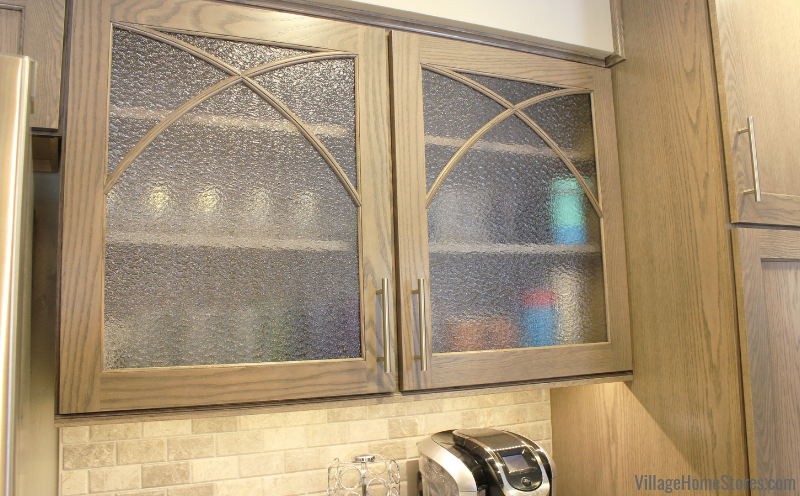 This kitchen uses a double cathedral-arched mullion shape with a textured glass insert. Texture or frosted glass can be a great choice if you want the decorative look of glass door cabinets… without having to “display” items within it. Another great glass texture in the completed space is found in the kitchen island lighting. 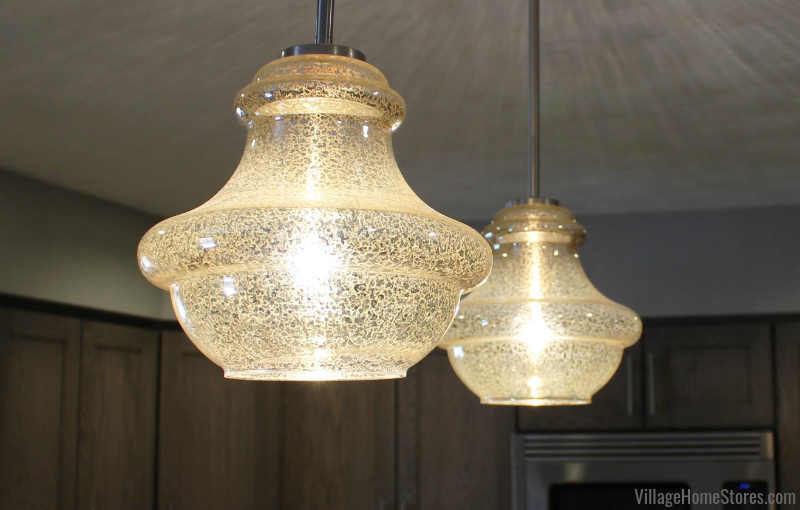 Two mercury glass pendant lights from the Everly series by Kichler look so stunning on and off! When illuminated, a warm glow is the result and when turned off, the glass still has such a unique texture! 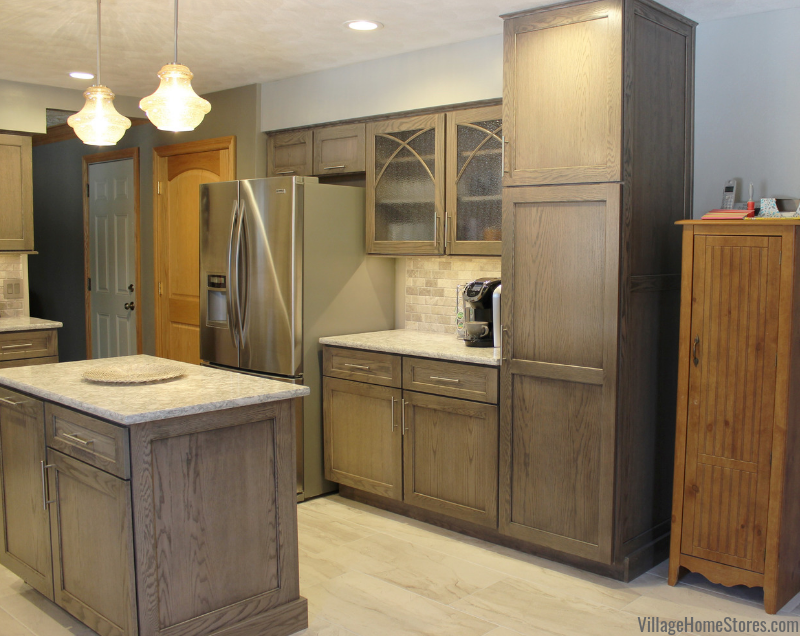 This Quad Cities area kitchen was remodeled from start to finish by Village Home Stores. That means we managed it all from design, to estimate, to schedule all through to completion. Our start-to-finish process keeps your project on budget and on schedule. To learn more about our process visit our website villagehomestores.com and be sure to check out our TV Show Sunday mornings at 9am on WQAD ABC ch. 8 to see start to finish projects completed right here in the Quad Cities. Have your own contractor or want to DIY the work yourself? That’s wonderful! Our experts can still work with you on design and material selection for your project. Either way, your first step is the same, reach out to our team. You can call us for an appointment at 309 944 1344 or complete this short contact form online. 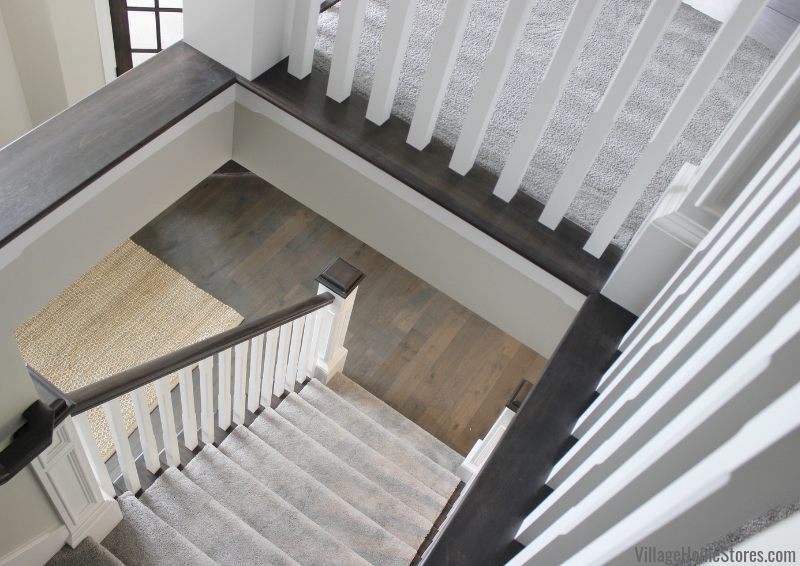 We just stopped by this new Hazelwood Home in Geneseo, IL and we are in love with every detail. New homes can often miss out on the character and uniqueness that older homes have. We are happy to report that this one is brand new but already has set itself apart! With great rustic details and an open concept perfect for a busy household, this great room and kitchen turned out incredible! Take a look! Painted Koch Cabinetry in the Maple Savannah doorstyle and “Ivory” finish creates an L-shaped perimeter to the kitchen. One focal wall includes the cooking zone with cooktop, hood, and wall ovens. The other wall is home to the taller, deeper elements like the refrigerator and pantry area. The kitchen is located as part of an open living room, dinette area, and hearth room. All of these spaces are within sight of each other and the way this family has styled the space is so perfect. 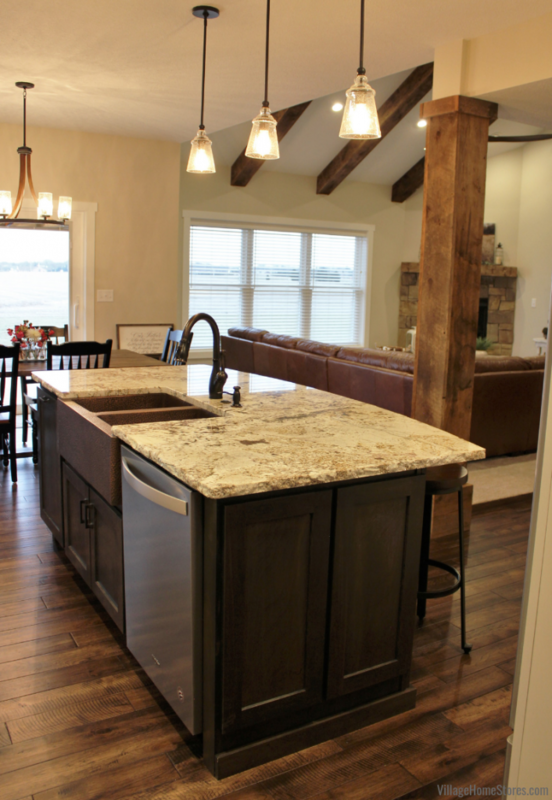 The island functions as a kitchen work surface and added casual dining space. The island cabinetry is also from our Koch Cabinetry line repeating the same doorstyle but this time in a Birch wood and “Stone” stain. We love how the gray stain allows the character of the wood-grain to be highlighted. Three pendant lights hang above the kitchen island. These “Urban Renewal” pendants from our Feiss line are so transitional in style they would look right at home here in this rustic setting as well as a historic home or even a modern eclectic city loft. Doesn’t that wrapped beam in the kitchen and the beamed ceilings in the lofted living room space add so much character!? We also included a modern farmhouse detail to the back of the island. The kitchen island is a single-level design and in place of wainscot doors or a smooth panel, we created an “X” design. This look is achieved with paneling, trim, and a skilled carpenter. There is even an outlet tucked away under the overhang. 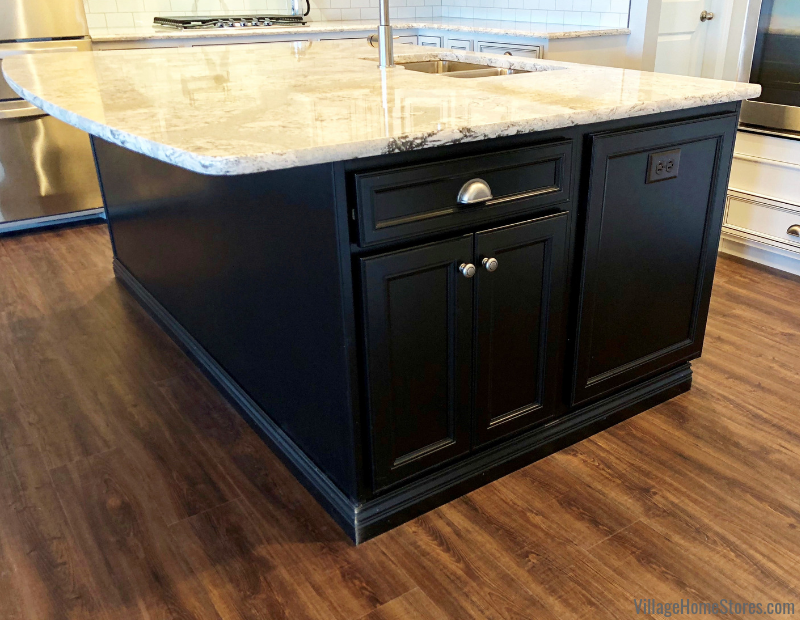 Island outlets like this are perfect for kitchen appliances but also laptops and other work-from-home devices or a homework station power source. The kitchen island is also the kitchen clean up zone. The kitchen sink and dishwasher are located right at the center of all activity. This dishwasher from Whirlpool is quiet at just 47 dba (normal conversation noise measures around 50 dba). It also has a third-level rack inside for items like lids and utensils. 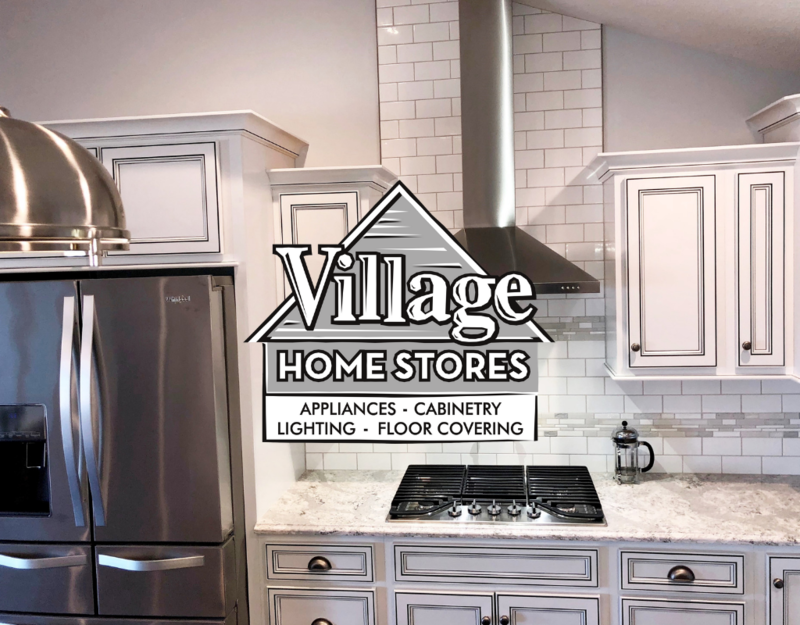 Shop appliances from Village Home Stores any day, any time at villagehomestores.com or stop by and see us at 105 S State in downtown Geneseo, IL. 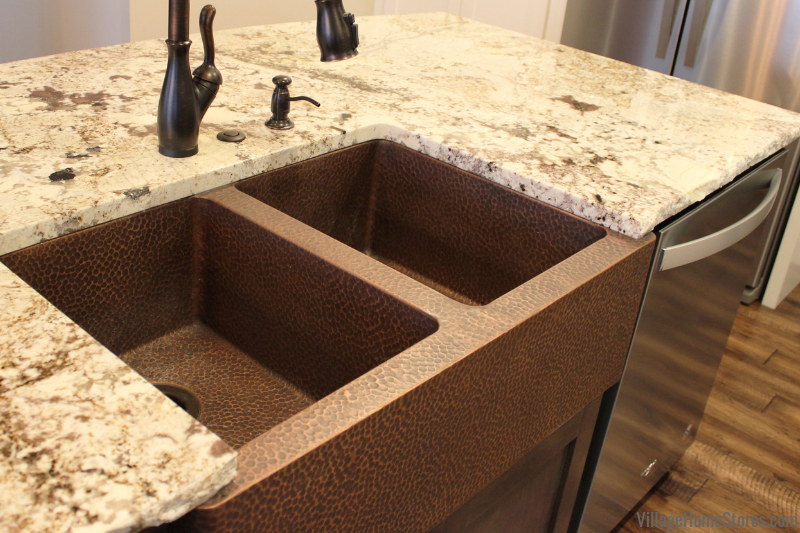 The kitchen sink introduces another great texture to the space, hammered copper. This double-well sink is a great compliment to the granite counters and mixed metals throughout the great room area. We have a well-executed blend of Oil-Rubbed Bronze, Stainless Steel, Copper, and even Wrought Iron in this space. Mixing metals may sound challenging to some, but it is such a great look! Take a look at another past project feature that blends copper, stainless, bronze and even black stainless all in one kitchen space! To see more images of this kitchen in detail including the island, click here to see the full album of photos now posted to our Best Of Houzz- winning portfolio online. Nothing can compare to the look and history that natural stone can bring to a project. As hard as engineered surface products are trying (and they are) to recreate the look of a natural stone, they will never rebuild the unique history each slab holds. This kitchen includes countertops in Desert Beach granite with a chiseled edge profile applied. This edge detail is not for everyone, or every project. 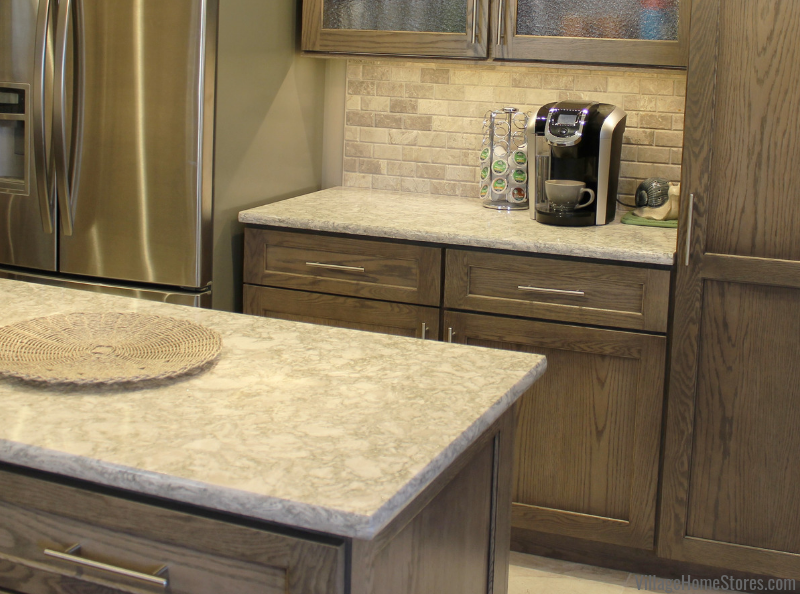 Here it adds the perfect blend of rugged and rustic to a smooth and polished stone surface. The wall surface in the kitchen was another area available for a new texture to be introduced. With so much movement and natural veining to the granite counters, a more controlled and consistent color in a wall surface was needed. 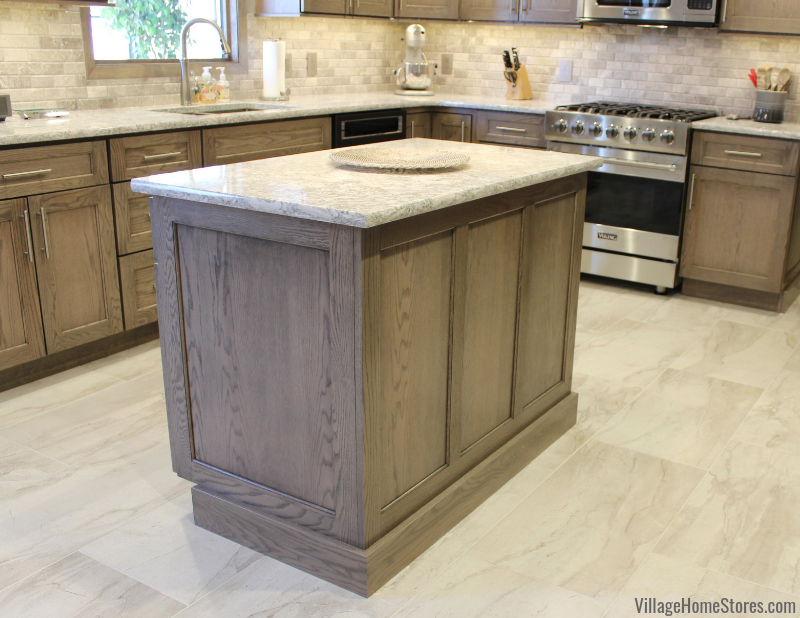 Travertine 3×6 tiles in the color “Light Noche” add a storied texture to the kitchen walls. Travertine is a tile that is often overlooked for transitional spaces but it deserves it’s spotlight here. This textured and tumbled tile can work in many styles including Italianate, heavy traditional, modern farmhouse, and Spanish-styled spaces. In this high-ceiling kitchen, we had the tilers install the Travertine to the top of the kitchen cabinet line. The Stainless canopy hood is installed over the surface. Cooking with a gas is ideal for any busy kitchen and this cooktop is ready for any task! 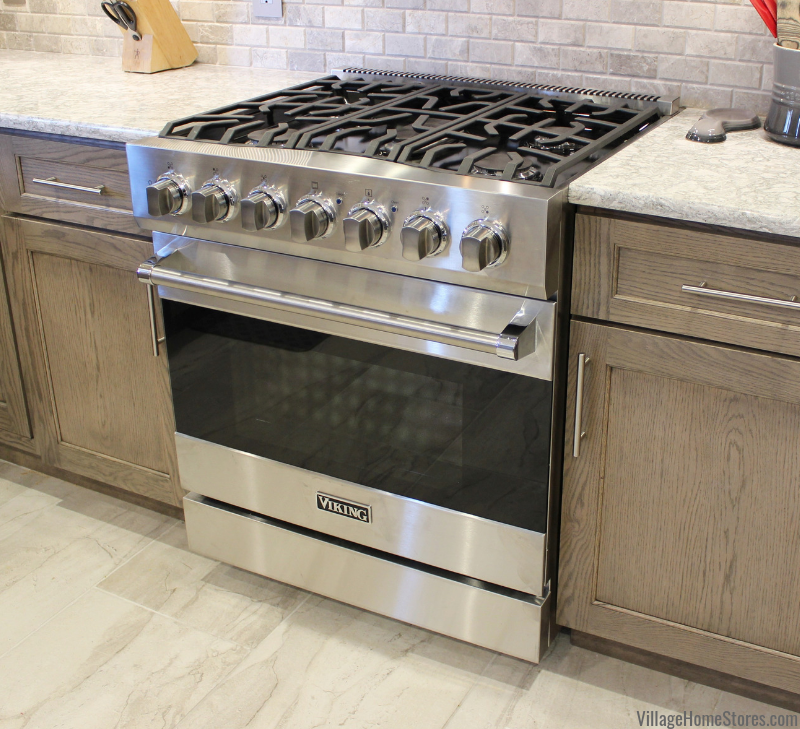 A five burner gas cooktop layout with continuous grates allow you to shift BTUs quickly and even slide a pan to another location. 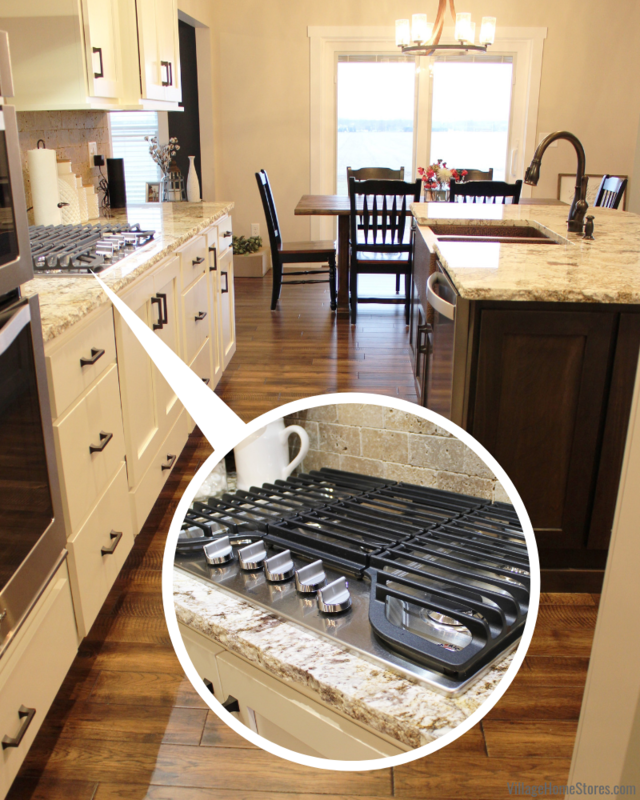 This cooktop measures 30″ wide and can be installed into a cooktop cabinet. Here we used a “reversed” base layout giving open cabinet doors above and a usable lower drawer below. 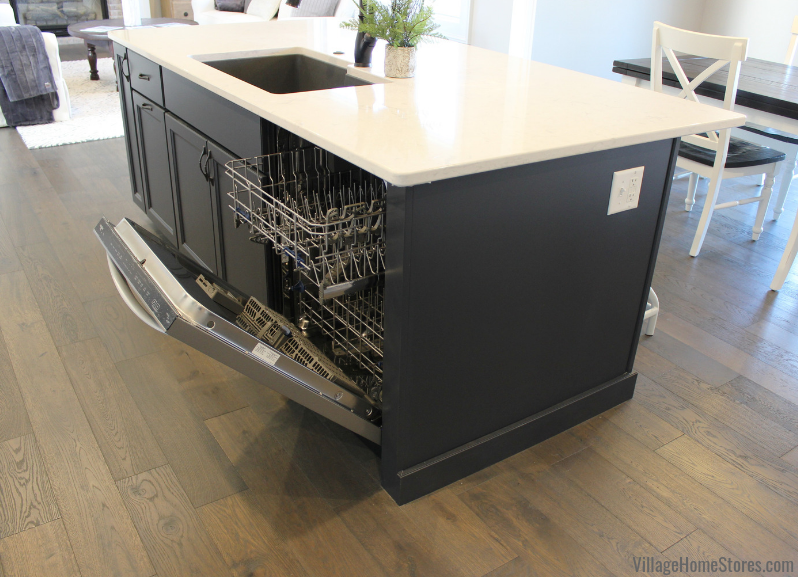 Your appliance salesperson at Village Home Stores will work closely with your cabinet designer to check that the correct finished look is achieved. The same is the case for wall ovens. A 30″ wide Combination Wall Oven and Microwave is a great choice for those who want the option of an occasional second wall oven. The top microwave section of this unit can be used to bake smaller single-dish items. Built-in appliances give such a customized look and can really help your kitchen layout look and function at it’s best. Installing the microwave as a wall oven here allows our design to include the chimney hood above the cooktop. We even gave the refrigerator a built-in look. … a pantry cabinet front that is! These doors open to a walk-in pantry entrance that is behind the pantry doors AND behind refrigerator area in this home. Kitchen storage goals for sure! Truly this open concept is “goals” for many of our readers. Imagine entertaining friends and family in this gorgeous new home. We must give a shout out to the true “MVP” surface for all of these spaces, the stunning Hickory hardwood flooring from our Paramount line! The same hickory is installed in the front foyer, hallway, kitchen, living room entrance, and hearth room. This is a 3/4 x 5 solid hardwood from the Barnwood series. The “Covered Bridge” color has so much depth and helps to compliment all of the wood finishes in the space. We have a full floor of another finish from this series installed in our Geneseo showroom. It truly is a must see for the color and texture this series offers. These planks are Kerf-Sawn and hand-scraped. When the light hits it you see the beautiful hand-scrapes and chatter-marks. A mix of metals and wood finishes even in the lighting selections! The dinette light repeats the seeded glass from the kitchen island pendants but also includes a wood sloped base to the chandelier. The “Grand Bank” series from our Kichler line is the perfect choice. 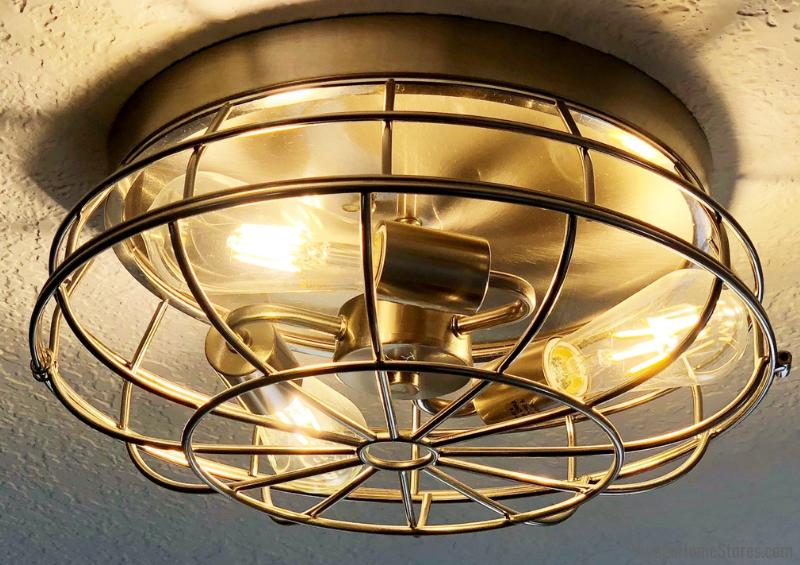 Our lighting experts work closely with new home customers to build a light list and work within your budget to find the perfect fixtures for your needs and tastes. Shop thousands of lights online, anytime here on our website or visit our award-winning lighting showroom in Geneseo, IL. Another blend of woods can be found with the statement ceiling in the living room. 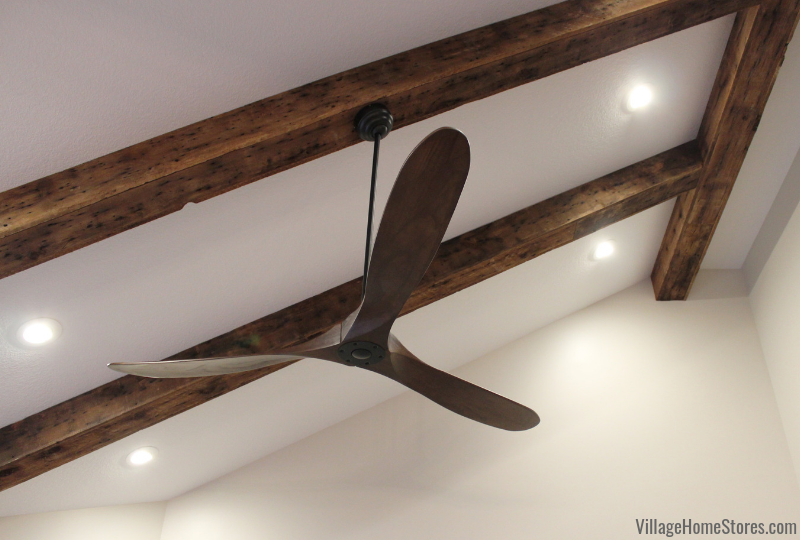 Wooden beams accent the ceiling shape and a 70″ wide “Maverick” fan from our Monte Carlo line looks like an art piece. Dark Walnut blades on this fan pick up the darkest of the wood stains and grain in the overall space. We have a lot of fans installed in our showroom to help you decide the right size and style of fan for your own home. Village Home Stores provided products throughout this entire home. The bathrooms, bedrooms, lower level, and laundry room all include design and product from Village. We also provided lighting for this entire home. We are the Quad Cities’ Regional lighting experts for both indoor and outdoor lighting products. 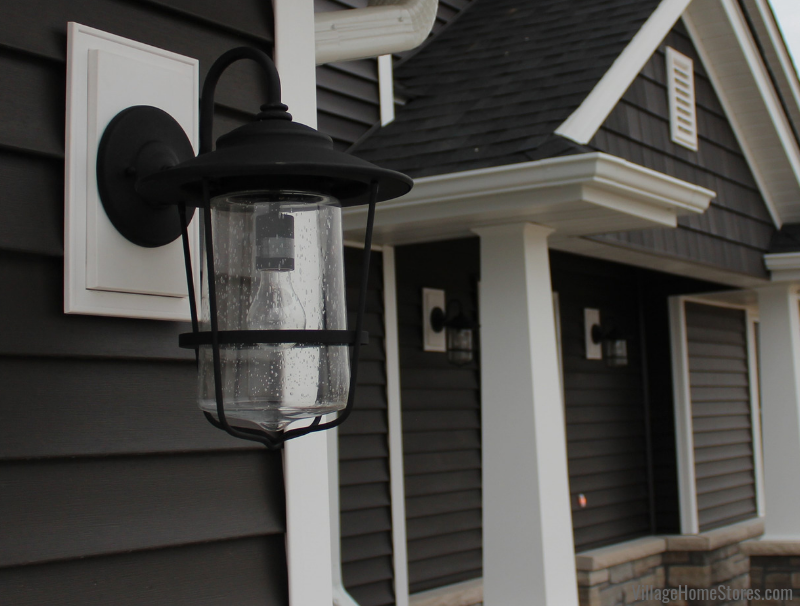 The “Creekside” lantern series from Capitol Lighting was used outside of this new home. Are you building or remodeling a home soon? We want to be a part of the process! Working with Village Home Stores can save you time and money. Your first step is just to reach out and learn more about our bidding process and FREE lighting bundle program. 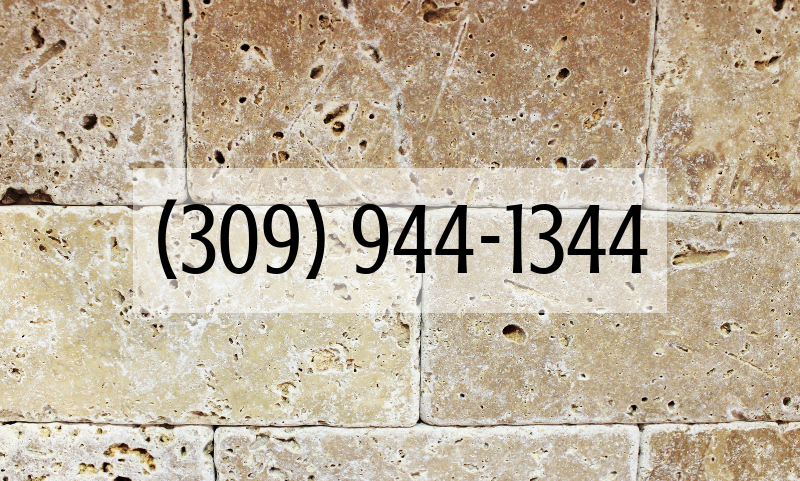 Contact us for an appointment by phone at 309 944 1344 or by completing this short online form. To learn more about Hazelwood homes visit their website here. We can’t wait to hear what you are working on and how we can help! 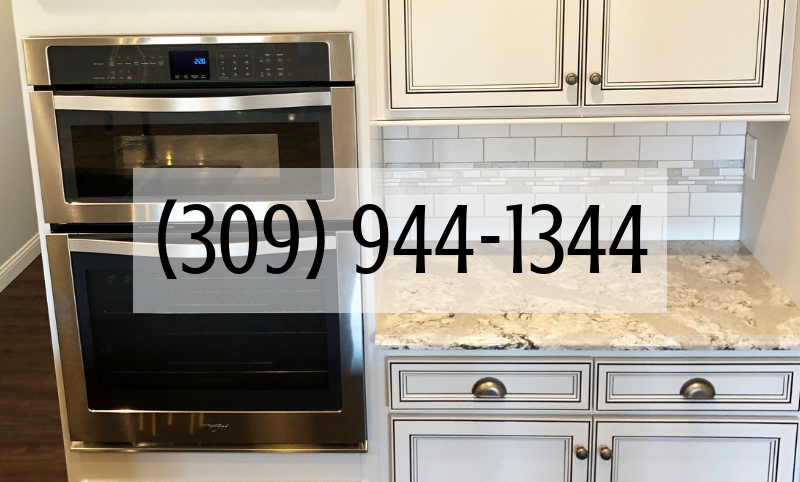 As we spend this upcoming week prepping our booth for the Quad Cities Builders and Remodelers Home Show, we thought it would be fitting to make our next featured project a new home kitchen. 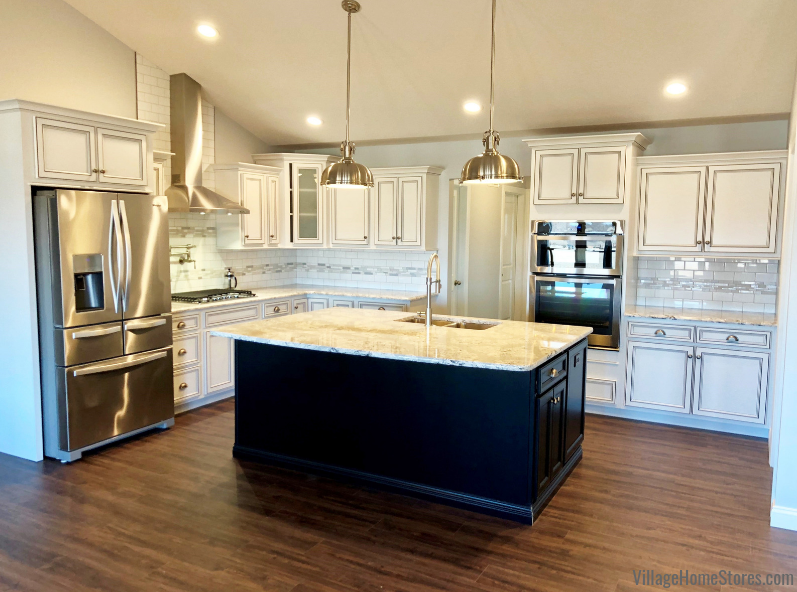 Village Home Stores has become well known to be your expert remodeling team… but did you know we also partner with incredible local builders to create amazing spaces in new homes? We are thrilled to have provided cabinetry and lighting for this home recently built by Advance Homes of the Quad Cities. The kitchen is truly breathtaking! 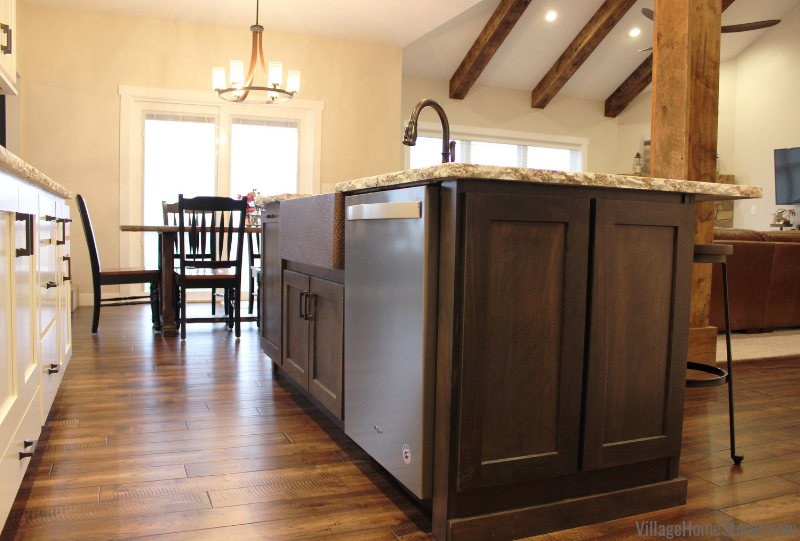 Kitchen cabinetry and lighting by Village Home Stores. Photo and home by Advance Homes of the Quad Cities. 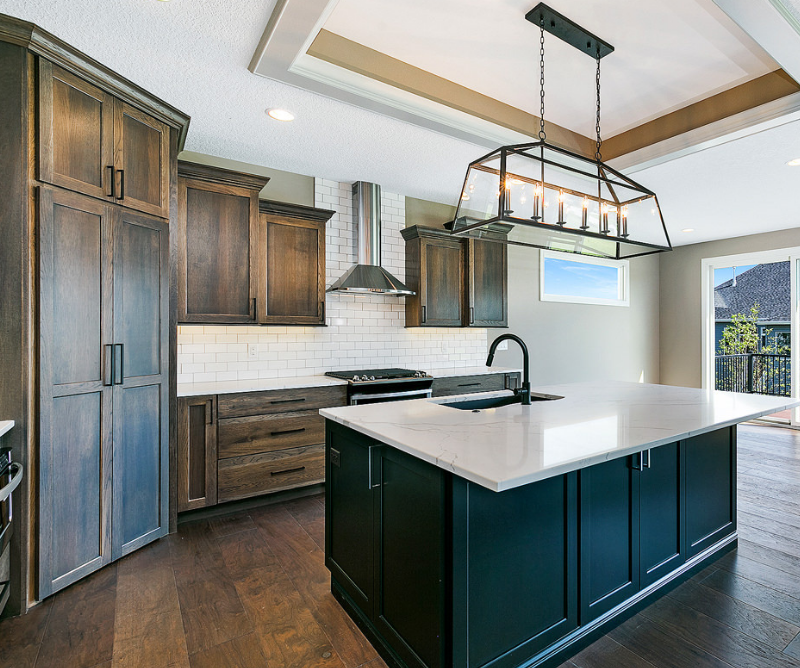 With a Matte Black painted kitchen island and Hickory cabinetry on the perimeter, this kitchen gives a rustic and restoration feel but in a more tailored and sophisticated way. The single-level kitchen island has access to storage all around it and an overhang on two sides allows for counter-height seating for many guests. The same “Bristol” doorstyle is used on the Maple painted island and the main Hickory kitchen cabinetry. The cabinets in this kitchen are from our Koch Classic Cabinetry line and the rich, smooth Hickory has been stained a warm gray named “Stone”. Look at how many tones and values of the hickory wood and stain come through on the cabinetry. 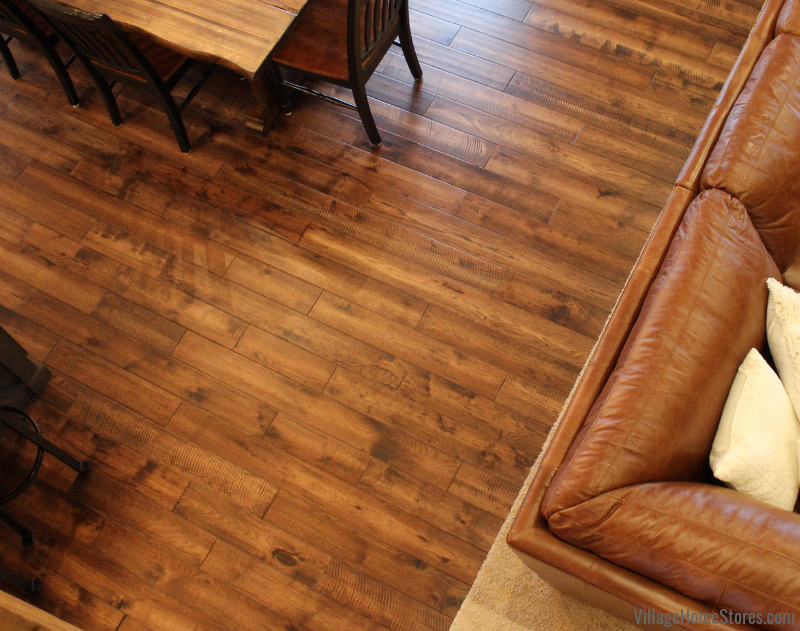 Hickory with a “Stone” stain is a great look that suites many styles and tastes. 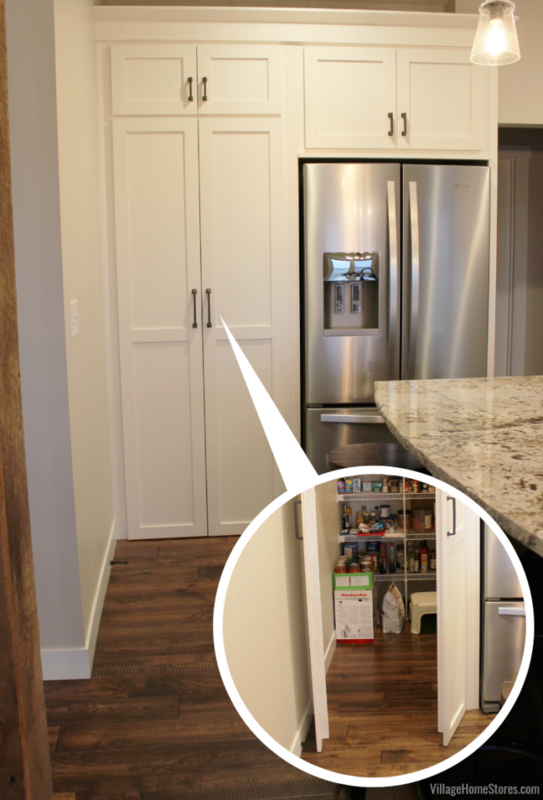 Walk-through pantry fronts are available from Koch Cabinetry to help create the look of a large pantry cabinet with the hidden reveal of a full walk-in space. Many of our customers building in the Quad Cities area request a design that includes one of these pantry fronts. In this kitchen it is located in the corner. Our cabinet designer has allowed this pantry front and side panels to reach all the way to the ceiling for a great finished look. The lighting for this home was also from Village Home Stores. We have an absolute crush on this island fixture the customer selected with our team! Lighting by Village Home Stores. Photo and home by Advance Homes of the Quad Cities. This Alanna 6-light pendant measures 54″ long and 14″ wide. Selecting the right lighting above a kitchen island is all about scale and design. In this kitchen a large, single fixture is used. With the open design to the light, it keeps the finished look open and airy. This light is from our ELK line and the restoration style fixture is an Oil Rubbed Bronze finish. Don’t forget that you can shop our complete lighting catalog online, anytime here at villagehomestores.com/lighting . When you are building a home with us, we will provide you with a lighting login to our website. 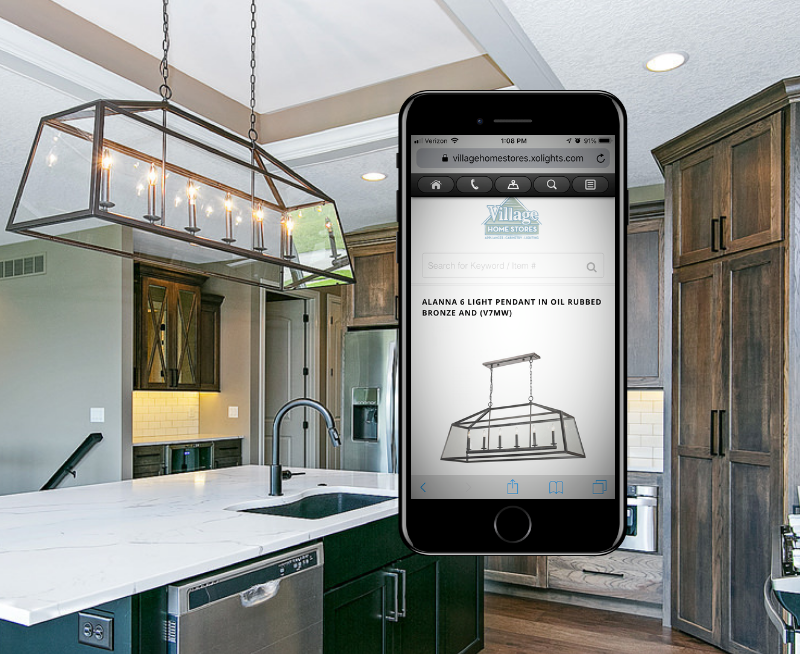 Once logged in you can collaborate with our new home lighting team selecting fixtures and viewing your estimates. 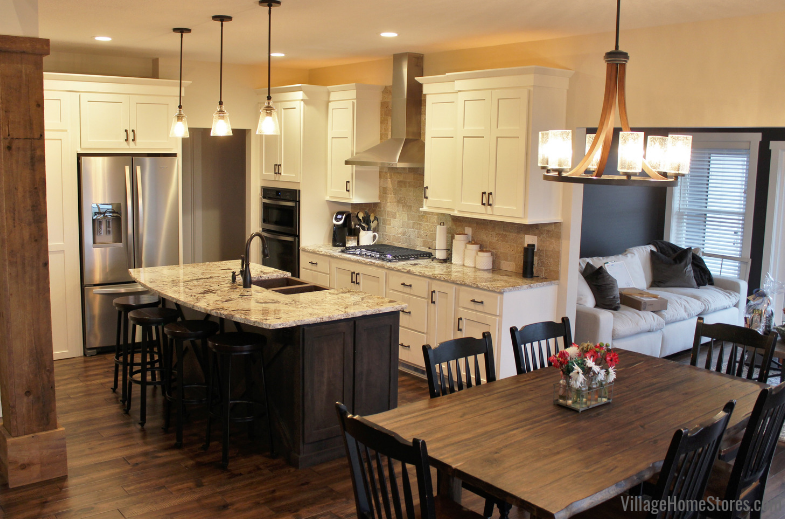 Cabinetry and lighting by Village Home Stores. Photo and home by Advance Homes of the Quad Cities. We repeated the same cabinetry from the kitchen in a nearby dry bar area. Here we have included base door and drawer cabinets and a space for a glass-front beverage cooler. In the wall cabinet design there is a center cabinet with doors prepped for glass. An X style mullion design adds a great detail. In place of glass, we have added antiqued mirror inserts. This is a interesting look and allows you to have maximum storage that doesn’t have to be styled for display inside. Down the front hall from this dry bar area is the front entry where we included a great lantern-shaped foyer light. 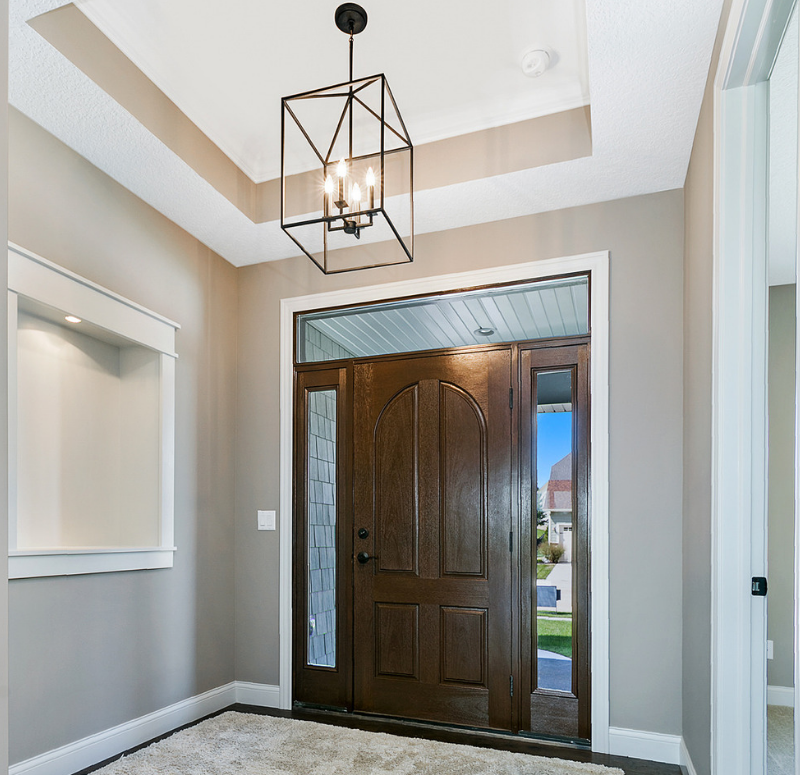 The “Blacksmith” lantern from Sea Gull Lighting gives the suggestion of traditional style with the shape in a more updated and transitional style by keeping just a wire open frame. 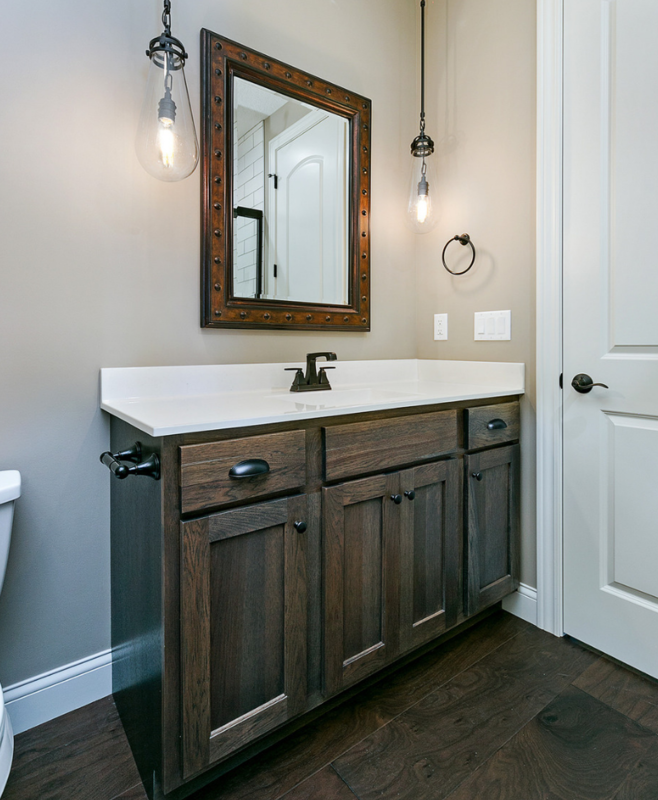 Each of the bathrooms in the home we also provided cabinetry, vanity tops, and lighting for. 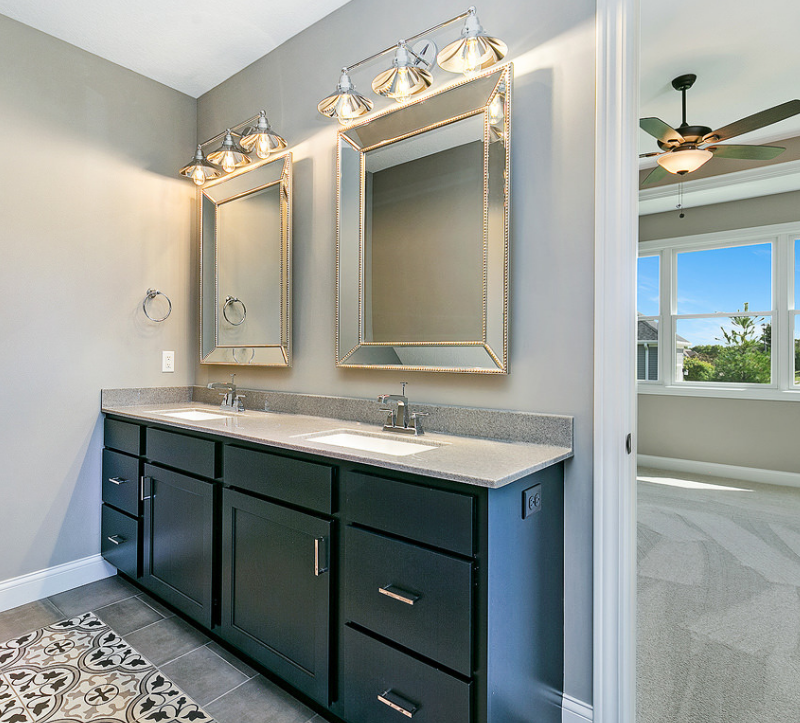 The main bathroom (shown below) includes a new trend of surrounding a framed mirror with two pendants. The “Gramercy” pendants from ELK make a unique statement in Oil Rubbed Bronze. Bath cabinetry and lighting by Village Home Stores. Photo and home by Advance Homes of the Quad Cities. The Hickory “Stone” cabinetry is repeated from the kitchen in this bath and a cultured marble vanity top from our Onyx Collection completes the look. In the master bathroom, a “Black” paint is used on the double bowl vanity. We love how this builder added an outlet on the end of the bath vanity. This keeps the wall clear and helps to keep the focus on the beautiful framed mirrors and vanity lights. A bright Chrome finish of these Feiss vanity lights help to create a contrast to the dark cabinet. This home from Advance Homes turned out so wonderful! We thank Advance for choosing to place our design and products into the great Quad Cities Area homes they are building. You can learn more about Advance Homes here on their website. Have a question about a product you have seen in this post? Want to meet our new construction sales team at Village? Just reach out! We can’t wait to hear what and where you are building! You can call us at (309) 944-1344 or complete the short online form here and a member of our team will be in touch. 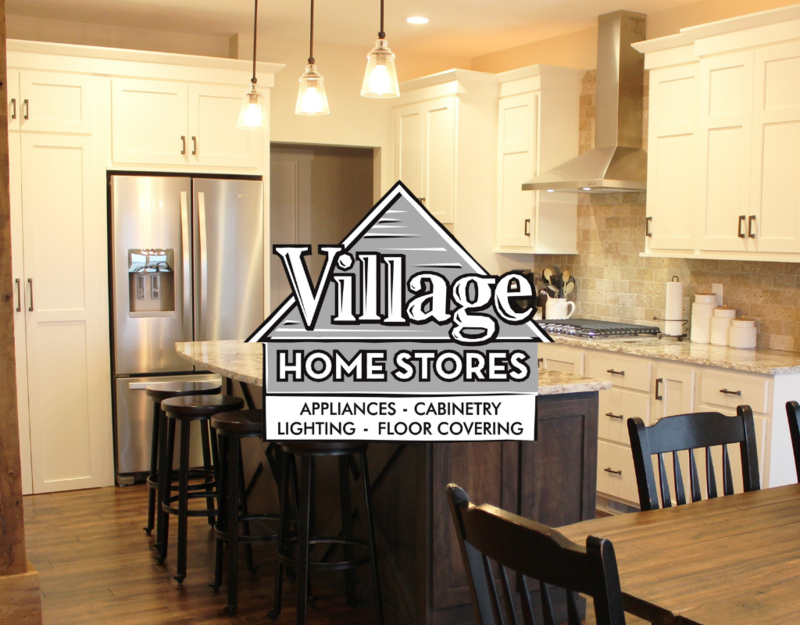 Learn more about Village Home Stores here on our website. Of course if you plan on attending the QCBR Home Show next weekend, just stop in our booth to meet our team! 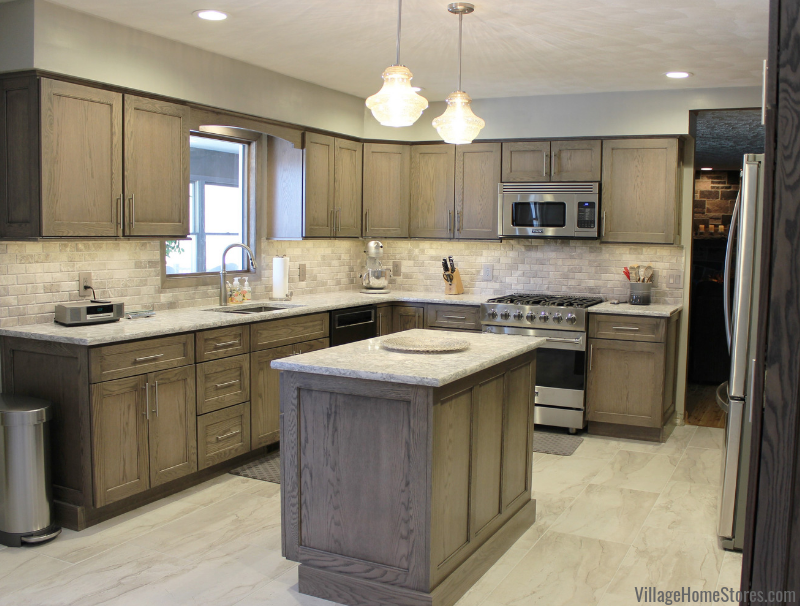 Our first featured kitchen of the year is in a brand new home built in Geneseo, IL by the team at Hazelwood Homes. 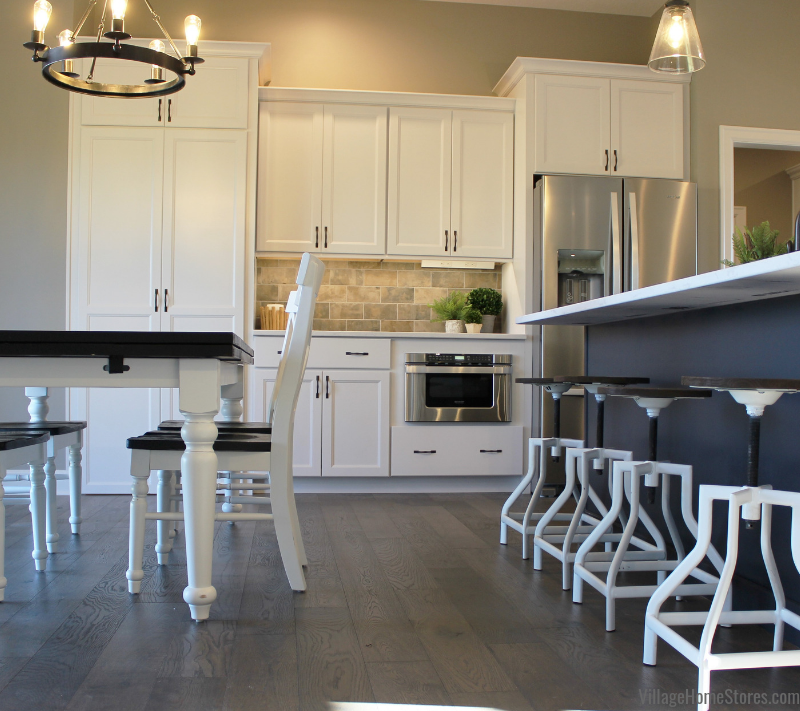 This space is a white painted kitchen with an applied glaze and a black painted accent island. It also includes quartz counters, an incredible flooring choice, and a Stainless Steel appliance package. We work closely with our new construction clients to build a team of experts from each department of our store needed. We are all one team working along with you to reach one vision. That way the time spent working on your project in and out of the Village Home Stores showroom is spent wisely. We value your time and we want to see you happy in your new home with the selections you have made from us. The process of building a home can be overwhelming but we do our best to make it fun an exciting. No matter if you are building, remodeling, or just browsing our blog for ideas, there are a lot of great material and design details in this space so let’s jump right in. What a beautiful space! Selecting white kitchen cabinetry in a great room kitchen setting is always a wonderful choice to keep the entire open concept light and airy. It is a classic cabinet finish that has remained on home magazines covers for years and years. This kitchen space takes a classic look to a whole new level though with added details and material choices that keep it functional and very eye-catching. Beginning with the statement accent island in the center of the kitchen. This single-level kitchen island includes storage on three sides, outlets on each end, and an overhang for counter-height seating. A gradual, curved radius has been applied to that overhang to soften the look. This island is the best area to showcase the countertop selection for the kitchen. The “Summerhill” design from Cambria Quartz is as durable as it is gorgeous. A blend of expertly curated neutral quartz colors makes it work with so many styles and material combinations. Cambria’s innovative fabrication process even adds a natural looking veining to the slabs. This gives you the look of natural stone with a control of color. It is also an incredibly durable product and perfect surface for any active kitchen. 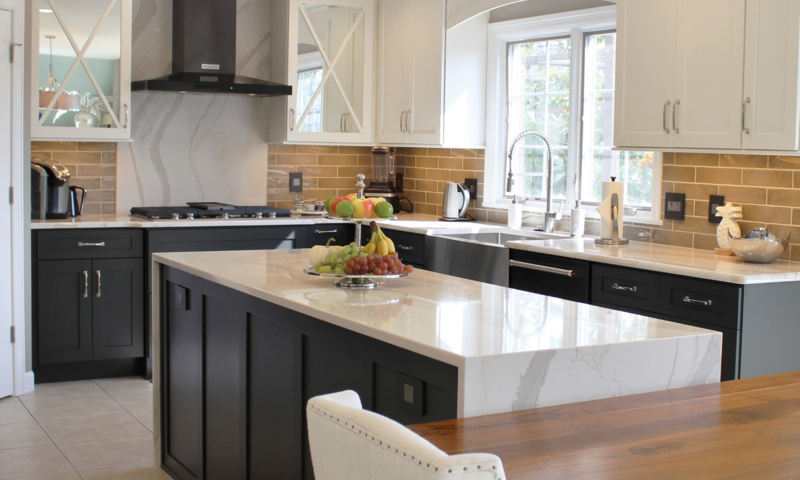 Learn more about Cambria Quartz here in a past blog post. Above is a closer shot of the “Summerhill” tops in this kitchen. Notice how it includes whites, beiges, grays, AND even a black fleck! Stop in and see samples and installed examples of Cambria Quartz at our showroom. 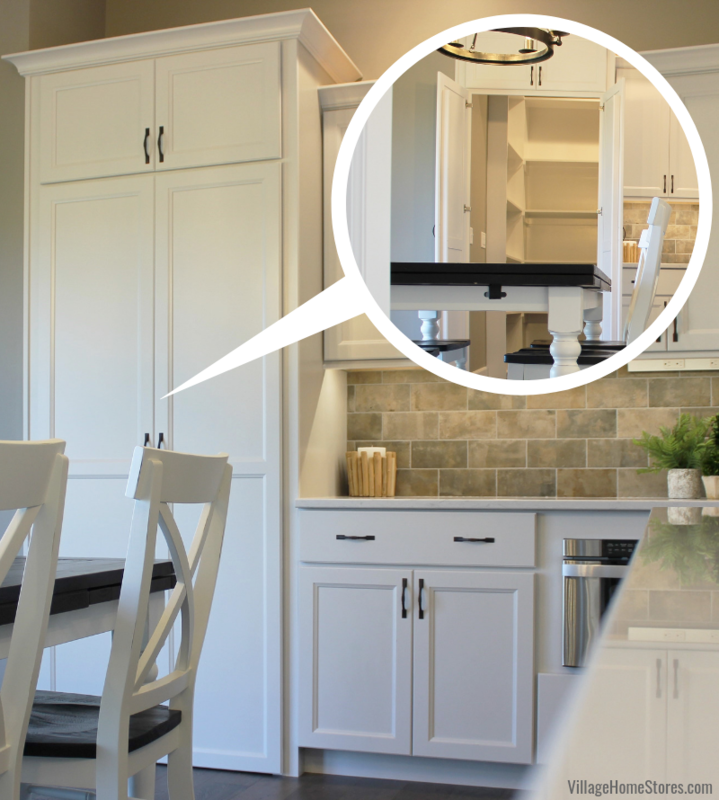 Curious how a Cambria color will look in your existing kitchen? There’s an AR app to “try” them on! Learn more here on the Cambria site! The perimeter counters in this kitchen have been an “Ogee” edge applied for added style and dimension. 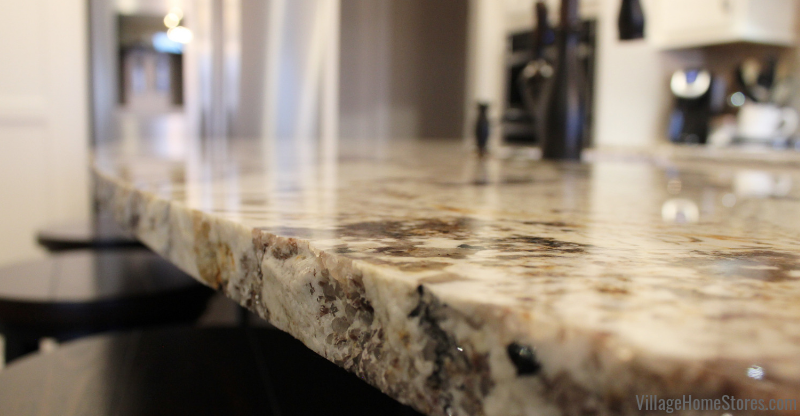 A great way to show off that the Cambria quartz colors are throughout the entire slab of material from top to bottom. Now do us a favor. 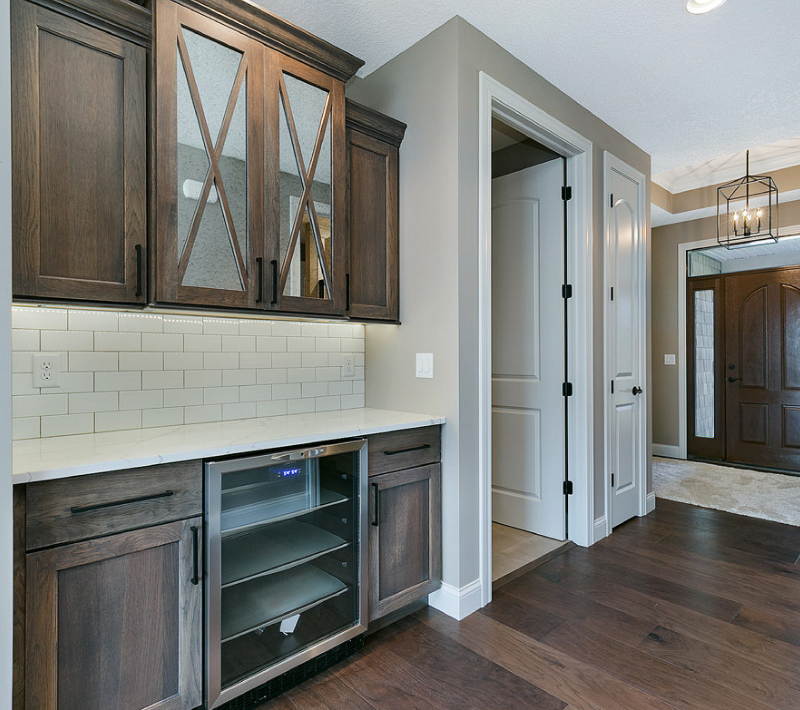 Scroll back up to the very first image of this kitchen and look at the inset doorstyle of the kitchen cabinets we’ll wait right here for you to return… and reveal that AREN’T inset doors at all! But at first glance did we have you tricked? Inset cabinetry is an incredible look and a very classic choice for any kitchen design. But in this home, we have given the illusion of a high-end inset door at a fraction of the investment. This is the “Lexington” door from our Koch Express line of cabinetry. It has been painted in the “White” finish and a “Black Accent” has been applied to the door details. That added accent is what give the illusion of a door inset and shadowed. This small detail added to a traditional-overlay cabinet door gives a great look. It also helps to compliment the black island cabinetry perfectly. 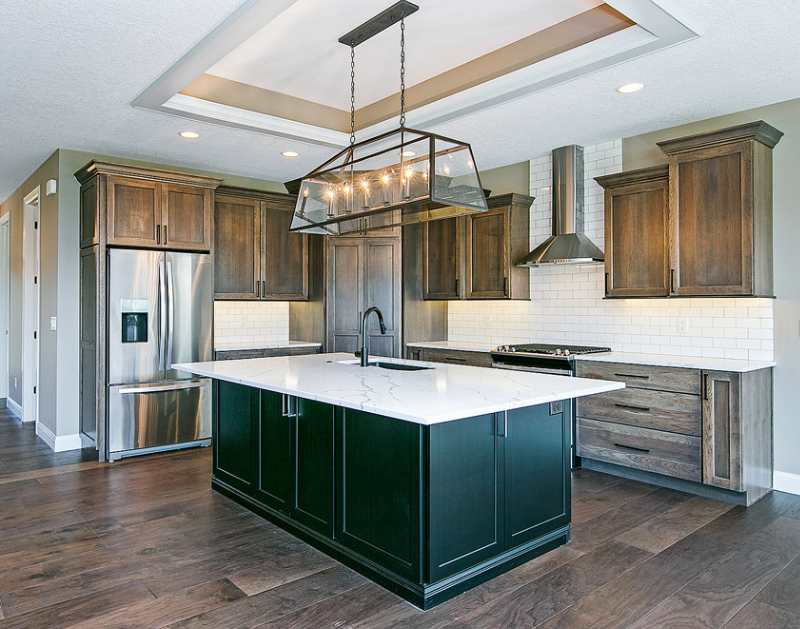 We love how the kitchen island pendants compliment the appliances in this space. These 16 1/2″ pendant lights are from Quorum’s Signature Collection and are in the Satin Nickel finish. 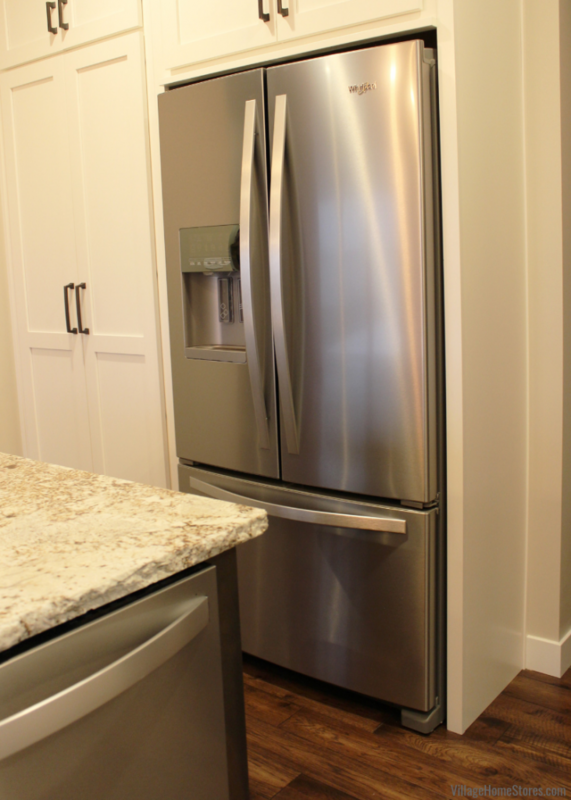 Satin nickel is a great compliment to the Whirlpool Stainless Steel appliances. A 26 cu. 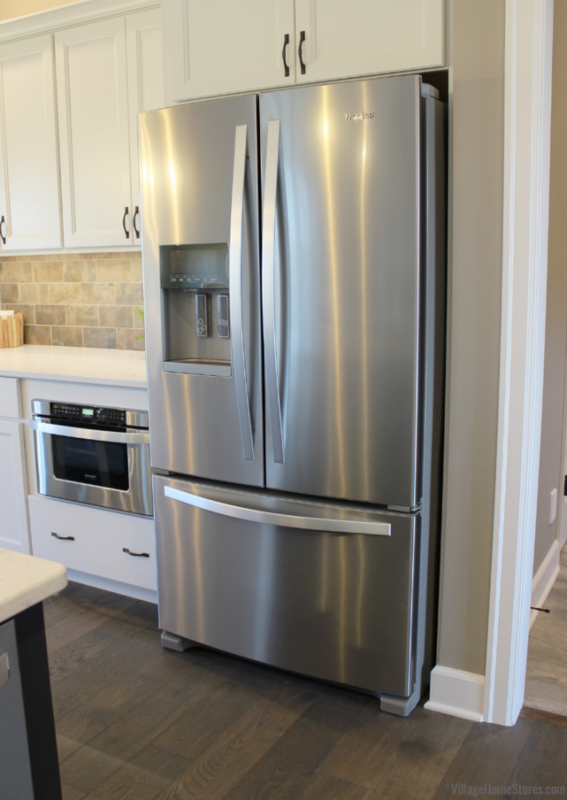 ft. French Door refrigerator with double drawers and dual icemakers is a great choice for this busy kitchen. 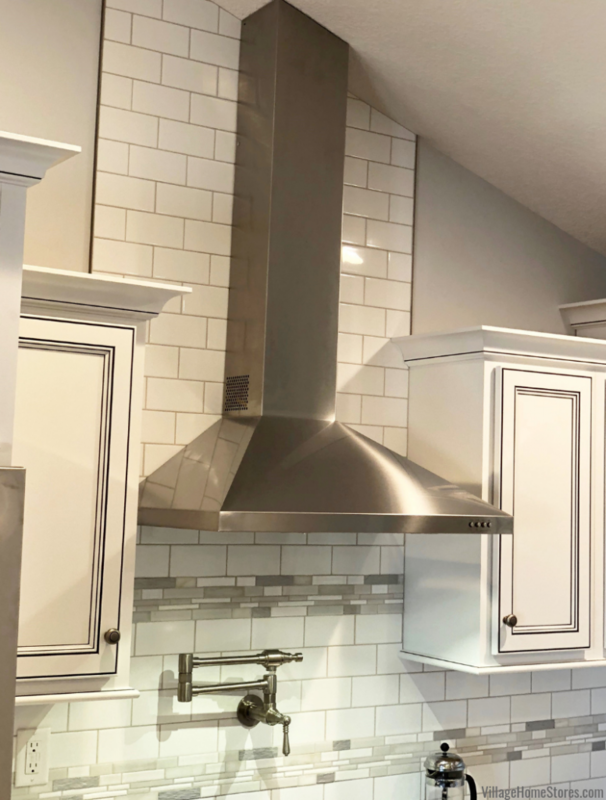 The focal point of this wall s the 30″ wide 5-burner gas cooktop with a tall chimney hood above. Shop all of our appliances any day, any time here on our new mobile-friendly website. What a great look for this wall of the kitchen design! Look at how the tile extends all of the way up to meet the angled ceiling behind the hood. A clean look on the edge of that tile is achieved by using a metal edge band to “cap” off the ends in a complimenting Nickel finish. 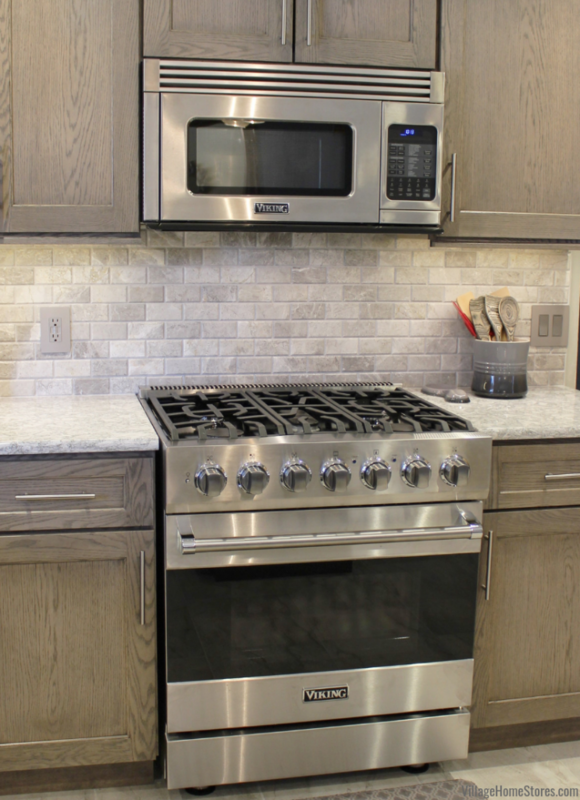 Oh trust us, we know you noticed that pot-filler faucet above the cooktop right away! Our envy-radar also went off when we saw it. Choices like these are what make a space gorgeous AND functional. 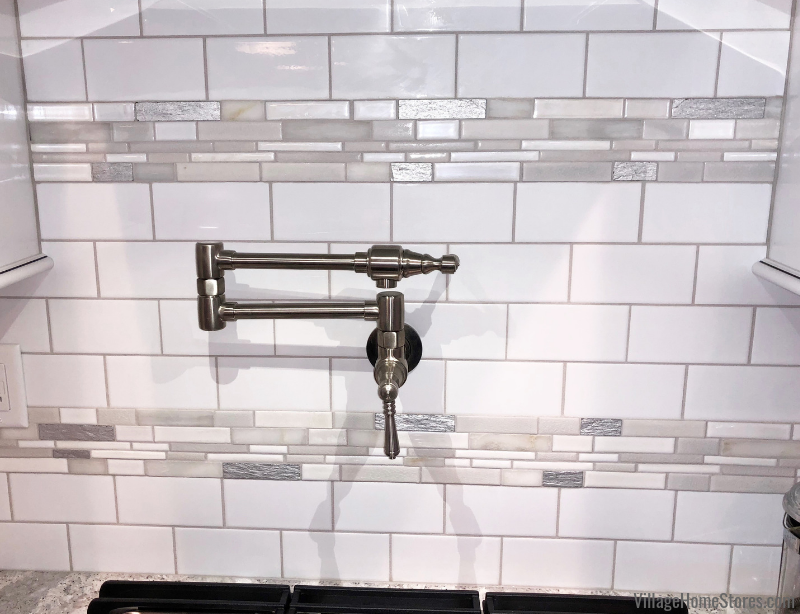 We wanted to also showcase here the use of a classic subway tile in white paired with an accent tile and contrasting grout. White subway tile with a dark contrasting grout is an on-trend look but it’s not for everyone. In this kitchen, it would have been a very busy look to have a darker contrast. This subtle color choice pulls a neutral from the counter surface color and the look is great. The accent tile here is from Epic Stone’s Interlocking series in the “Everest” color combination. We also used this same accent tile in one of the tiled showers in the home (shown below). 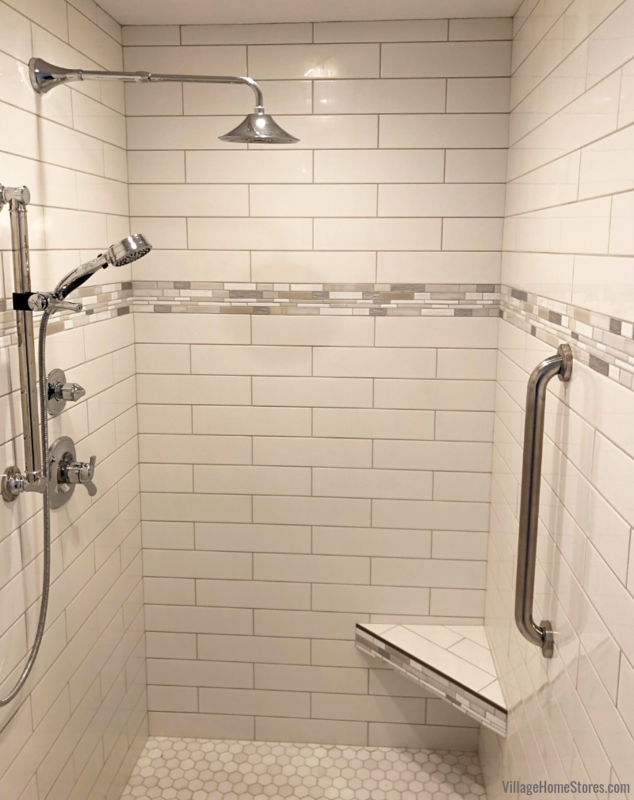 This shower includes an elongated version of a subway tile These tiles are 4″ x 16″ and installed horizontally, they add a stylish detail while helping to make the shower seem wider. That same accent tile fro the kitchen is used as a band around the shower and also reappears on the front face of the corner bench. A 2″ hexagon tile is used here as the shower floor. Notice also the installation of a shower grab bar at the entrance. See more examples of grab bars we have installed here in this Houzz ideabook. This has become a common request from our clients of all ages and abilities. Installing assistance like this that will help a customer age-at-home and just remain safe is always a great investment! Back to the kitchen where we can mention another important investment. 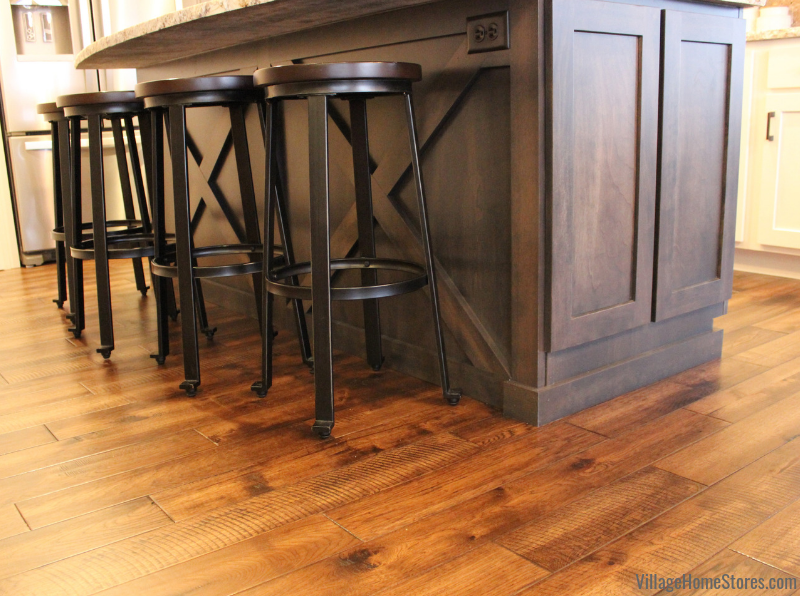 The flooring you choose for a new home is so important. You want to make selections that will be durable and compliment all of the other selections you are making for fixtures and furniture in your new home. 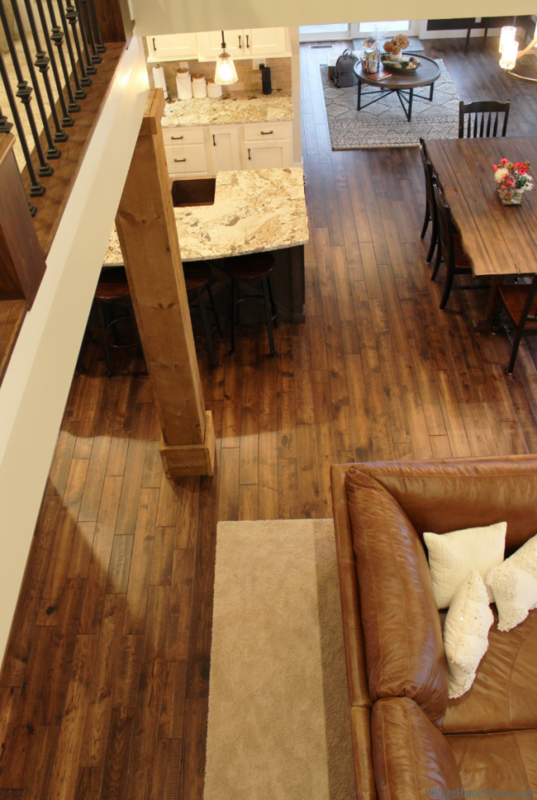 In an open concept layout like this, our COREtec engineered plank floors are a great choice. COREtec comes in a large variety of wood styles and finishes so there truly is something for any space. What our COREtec customers love beyond the look is the performance! These surfaces are kidproof, waterproof, and petproof! For our remodel customers they are great because they can also easily be installed over existing hard surfaces. 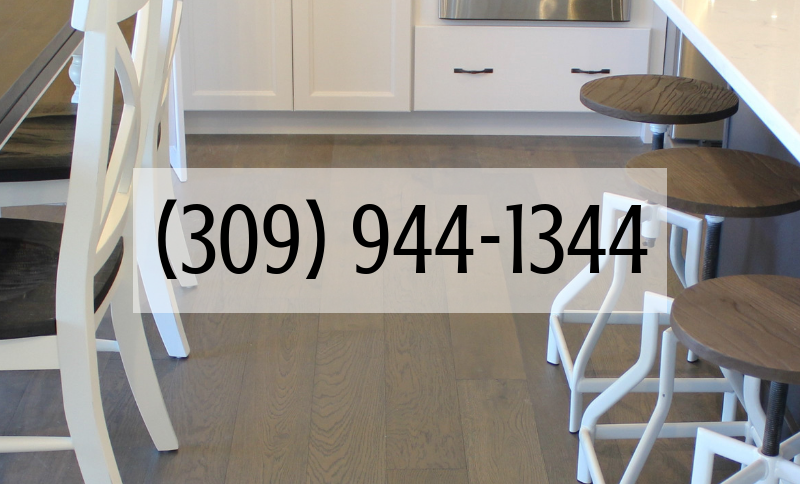 Contact a flooring expert at Village Home Stores to learn more. We are thrilled to partner with Hazelwood Homes and all of our builders with designs and selections for entire homes being built in the Quad Cities region. If you are not familiar with Village Home Stores, we want to let you know that we also offer a bundle program for our customers who are building. This is a program put into place to put money back into your pocket once the building process nears completion. As you shop throughout our one-stop-shop showroom, your total purchases are bundled together to earn you FREE LIGHTING credit off your final lighting purchase. Learn more about this program by clicking here for a flier explaining it. Contact one of our lighting experts with any questions. Our new home lighting expert will sit down with you and your print to help create a light list and determine your personal style and wishlist for the project. We will work with you and your lighting budget to find the right fixtures to suit your needs. In this project we included great selections like the Kichler “Braelyn” dinette light (shown above) and this unique caged “Scout” semi-flush light from Savoy House (shown below). 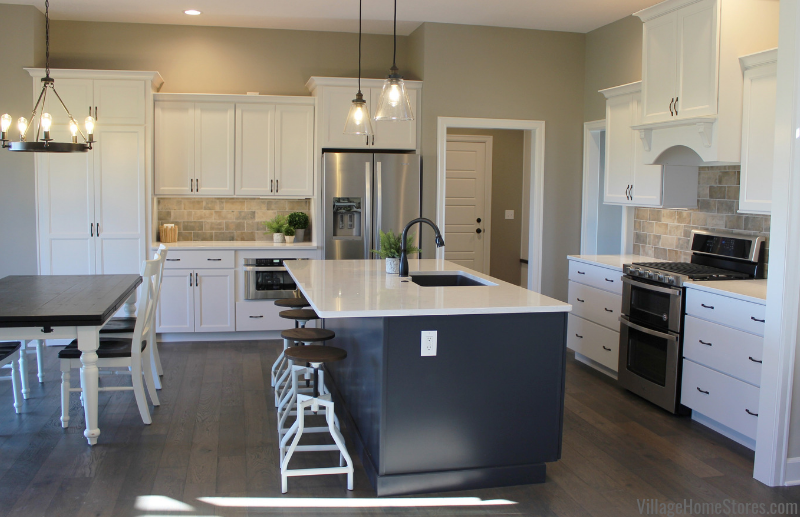 This home turned out so great and we are so honored that these clients choose to work with Village Home Stores to design and furnish a part of the space they have now moved into. If you would like to see more images from this project in Geneseo, IL we have uploaded a full album to our award-winning Houzz page. You can find that album of kitchen, bathroom, home bar, and even laundry room images here. Are you planning on building or remodeling in the Quad Cities area soon? The new home team at Village Home Stores is excited to play a part! We have a checklist and a process in place for all the paths of your project with Village. Your first step is just to reach out to learn more about it. You can call us at (309) 944-1344 or complete this short online form on our website. You can always stop by our showroom at 105 S State Geneseo, IL to browse. We do recommend that you have an appointment if you are wanting to begin the bidding process. We can’t wait to hear about what you are working on! Blue cabinetry is having more than just a “moment” in the Kitchen and Bath industry! We have installed so many stunning spaces over the past fews years that have introduced a painted blue finish and now it is become such a staple option for Transitional, Scandinavian, and Modern Farmhouse styled spaces. Blue cabinetry is forecasted to remain an accent color for many years to come. 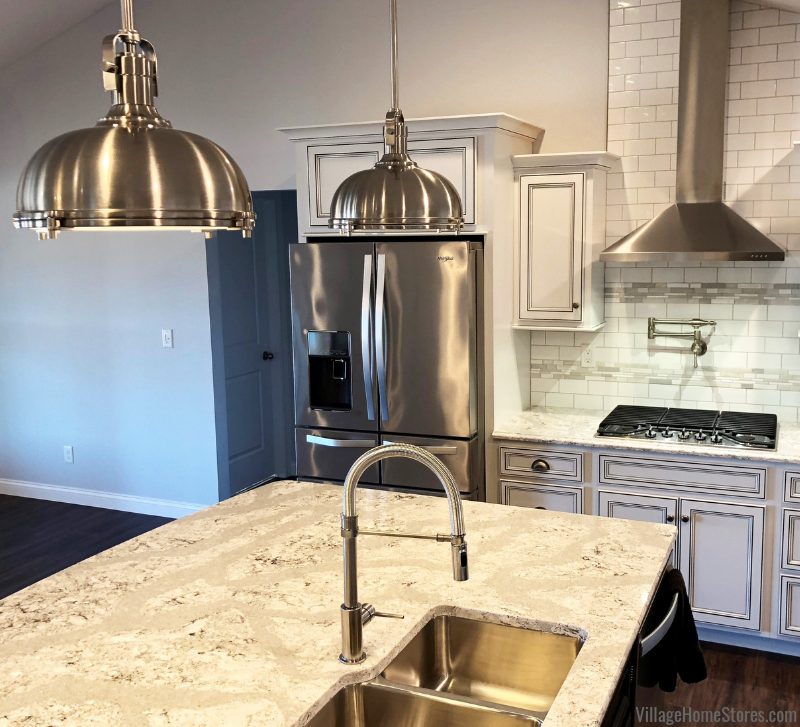 Our Koch Classic Cabinetry line makes a neutral blue-gray paint called “Charcoal Blue” and it truly makes a great statement as the island finish in this Bettendorf, Iowa kitchen. 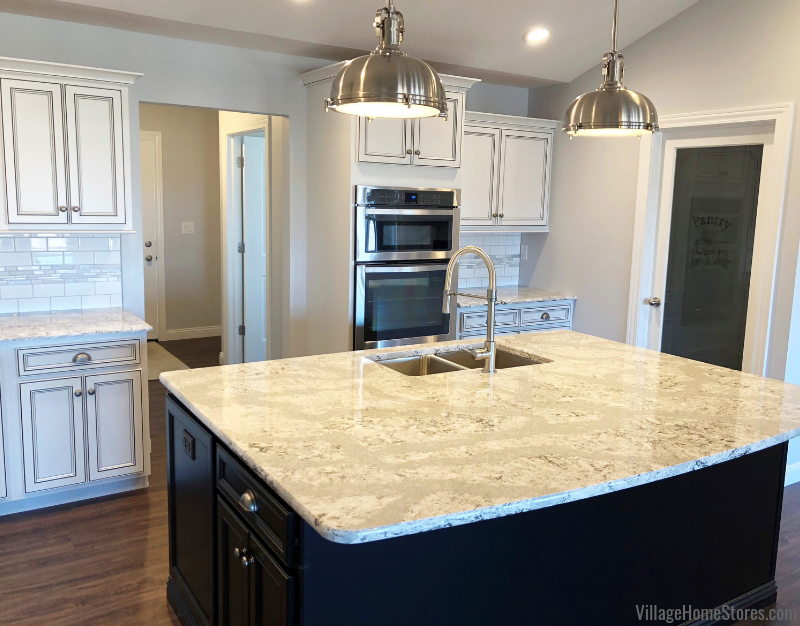 This home, built by Edgebrooke Homes, was a QCBR Fall Parade of Homes stop and it is such a wonderful example of how Village can partner with you and your builder to save you time AND money. Shopping our one-stop-shop experience and bundling your purchases is the way to go and it gets you a a more complete design concept! Complete, cohesive designs begin with a vision early on in the design phase. Village works hard to keep you on track with that vision (and budget). This great room design concept blends bright painted whites, a Charcoal Blue accent, gray-toned wood floors, and warm rustic woods. The main kitchen perimeter is a “White” painted cabinetry in the same “Bristol” doorstyle as the kitchen island. Staggered heights and depths of wall cabinetry can help to add interest to a kitchen design that has tall ceilings. This kitchen also includes two heights for casual dining. 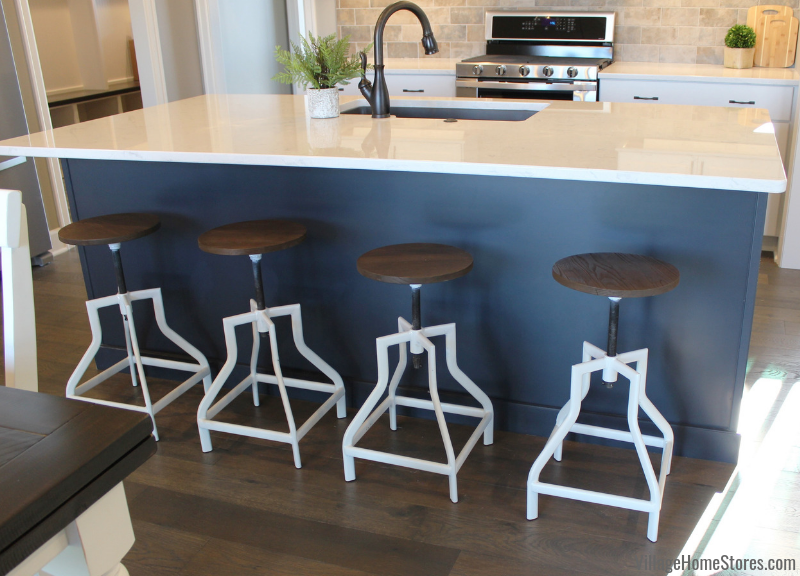 A large dinette area at dining height, and a single-level kitchen island extends to add more seating at the island. The pantry and refrigerator wall of the kitchen actually conceals a hidden feature. The pantry doors open to reveal access to the large walk-in pantry space that turns the corner behind the wall of cabinetry. This same look can be applied in a remodel situation with existing closets or unique spaces. Ask your designer at Village Home Stores how we can include one in your own design. Village Home Stores doesn’t want to just know what kitchen spaces inspire you… we want to know what your own dream kitchen looks like. We know it can be difficult for our clients to have a clear vision of what that looks like early on in the design phase. That is why we are here to help. You showing us spaces and ideas that inspire you, helps us build a concept for your own space and tastes. We have a number of great specialty cabinet options like this pantry front that can take your design to the next level! Press play below to see the pantry doors open up to reveal the hidden room behind them. The tall pantry cabinet is balanced by the refrigerator surround on the opposite end of this wall. Also included on this wall is a microwave drawer unit. 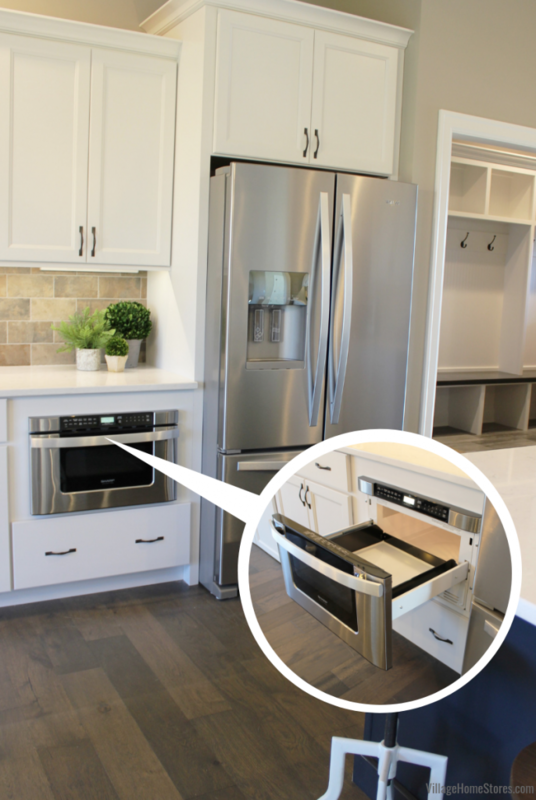 Microwave drawers are a great way to keep the microwave appliance off of the counter and reachable for any users. Another great location for a microwave drawer is in a kitchen island. 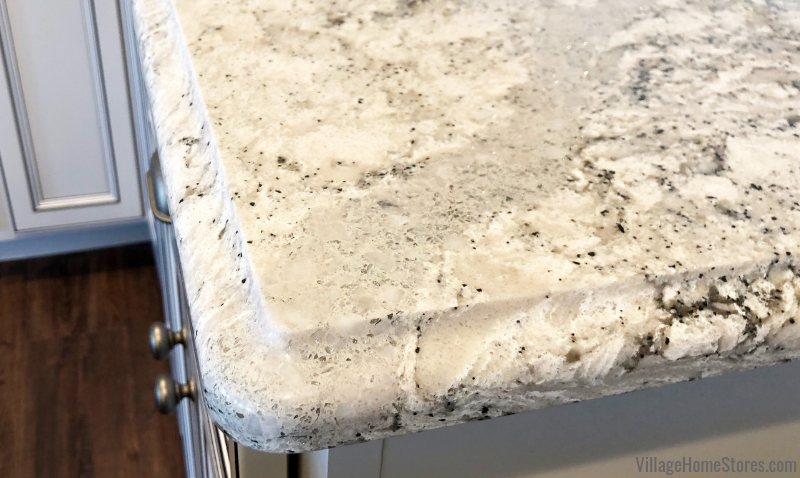 This section of the featured kitchen creates a great landing space of countertop for loading and unloading the refrigerator and also a work surface for microwave use and food prep. Counter depth refrigerator models can really help you so much when the design demands it for traffic paths and space allowances. In this kitchen, a standard depth unit works perfectly “built-in” against the wall on one side and with a tall, deep panel on the other. A deep cabinet above completes the look. The 36″ wide Whirlpool model fits and offers so much great storage. It also stays looking great with a Fingerprint Resistant Stainless Steel finish that easily wipes clean. The kitchen island includes the kitchen sink and a Whirlpool dishwasher. This dishwasher is quiet at just 47 decibels (normal conversation is at about 50 dba). A TotalCoverage Spray Arm cleans with twice the jets as usual and an In-Door Silverware Basket frees up rack space by easily fitting on the front of the lower rack or in the door to make room for more dishes. To shop our appliances you can browse our website here anytime or day. 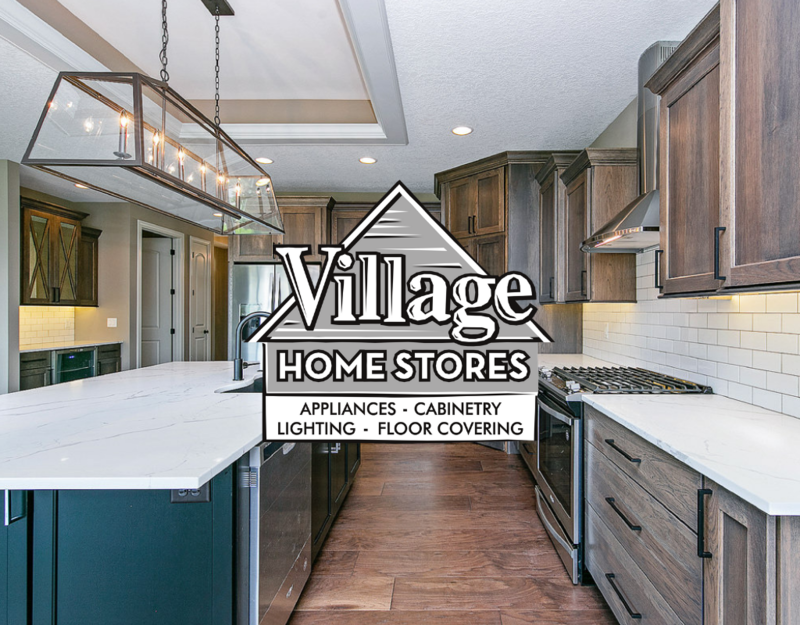 Village Home Stores offers our customers an expert sales staff and the award-winning customer experience you deserve plus our Local Low Price Guarantee. 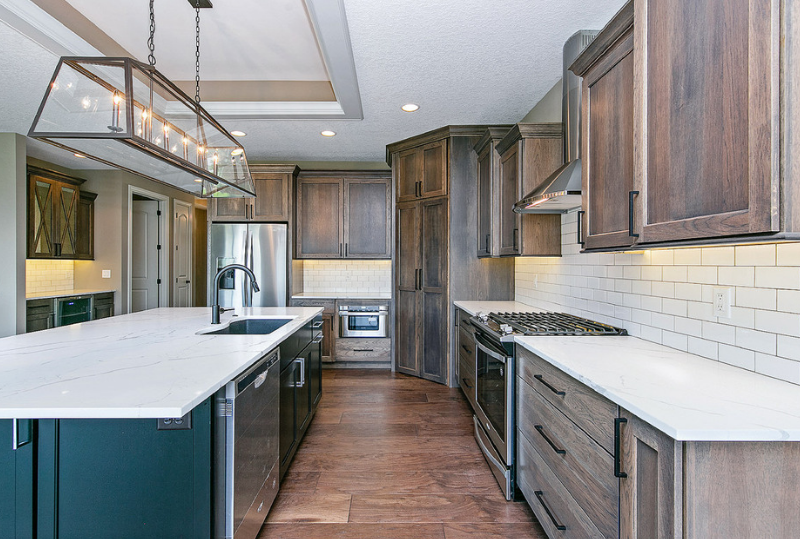 The countertop surface in this gorgeous kitchen is the Swanbridge design by Cambria Quartz Surfaces. 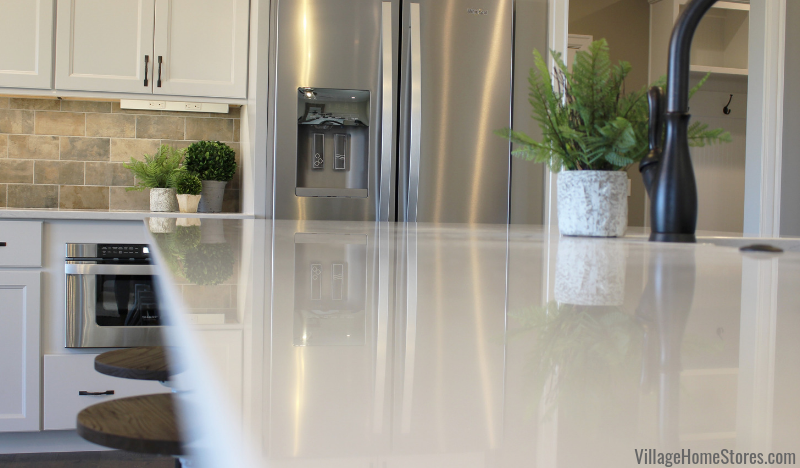 The look of a polished, white marble in a durable maintenance-free surface. Swanbridge is available in the polished (shown) finish as well as a soft, matter finish. The lighting for the great room has a dark, matte bronze metal finish. Clear glass on the Feiss “Baskin” pendants above the island keep the space feeling light and airy. 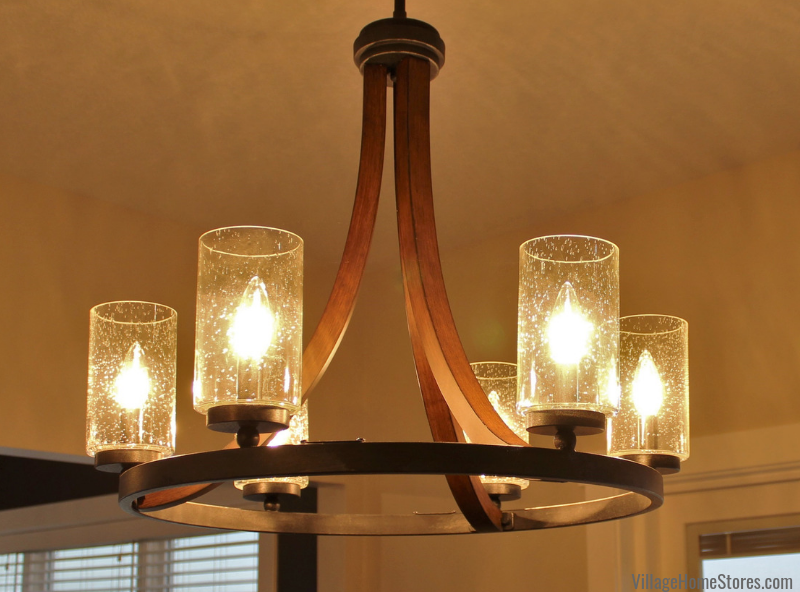 The Sea Gull Ravenwood Manor Chandelier in the dinette area has 5 exposed vintage bulbs. 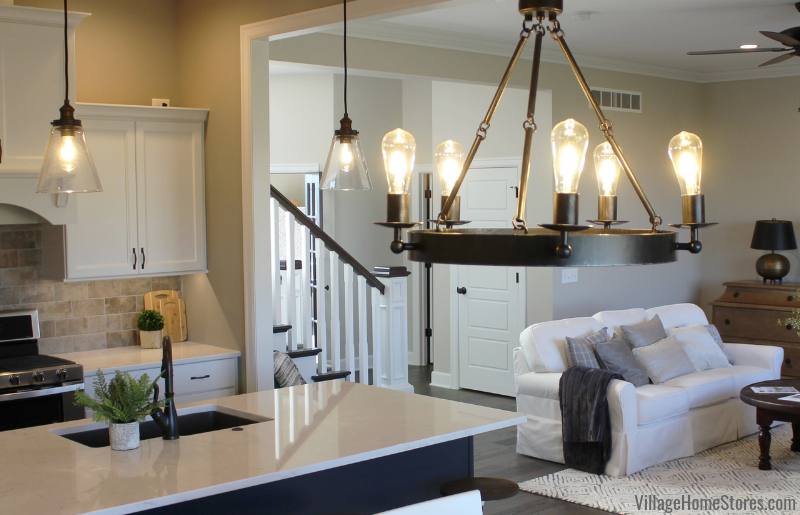 This 5-light fixture adds style and impact to the space. A great look for this casual but upscale space. 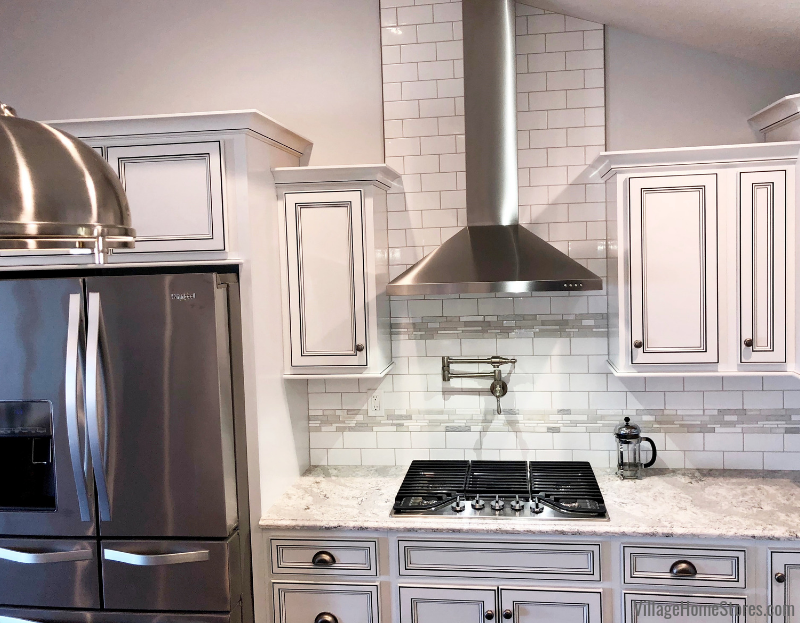 By not including a microwave hood in a kitchen you and your designer at Village Home Stores have many more decorative options for a hood in your kitchen. 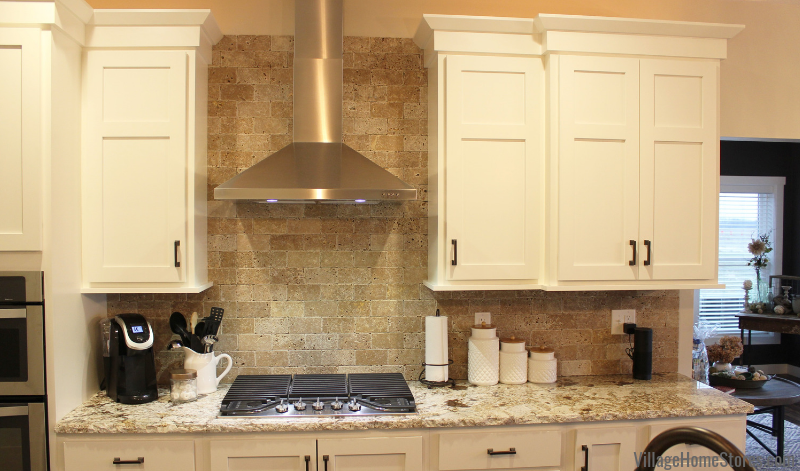 In this Bettendorf kitchen design we were able to include a decorative wood hood. We fit the hood cabinet with a 390 CFM Broan insert for the range and cooktop area below. Check out the great freestanding double-oven range on this wall. This model is packed with so many great features like Frozen Bake™. Skip preheating the oven for frozen faves like pizza, lasagna, chicken nuggets, fries or pies, thanks to Frozen Bake™ technology. It also bakes with true convection cooking. That helps you cook foods faster by using a third element plus a fan to distribute hot air evenly over, under and around your food. The kitchen is a part of a larger great room space and a gorgeous engineered Oak wood floor ties many of the main-level spaces together. 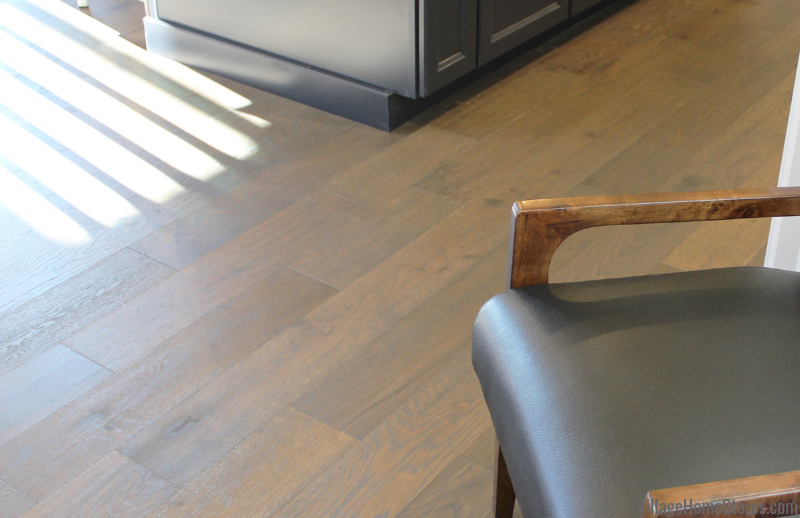 This engineered Oak is from Hallmark Flooring’s Novella series and it is the Fitzgerald color. That same flooring is installed in the foyer, great room, kitchen, pantry, dinette, powder room and the formal dining room shown above. 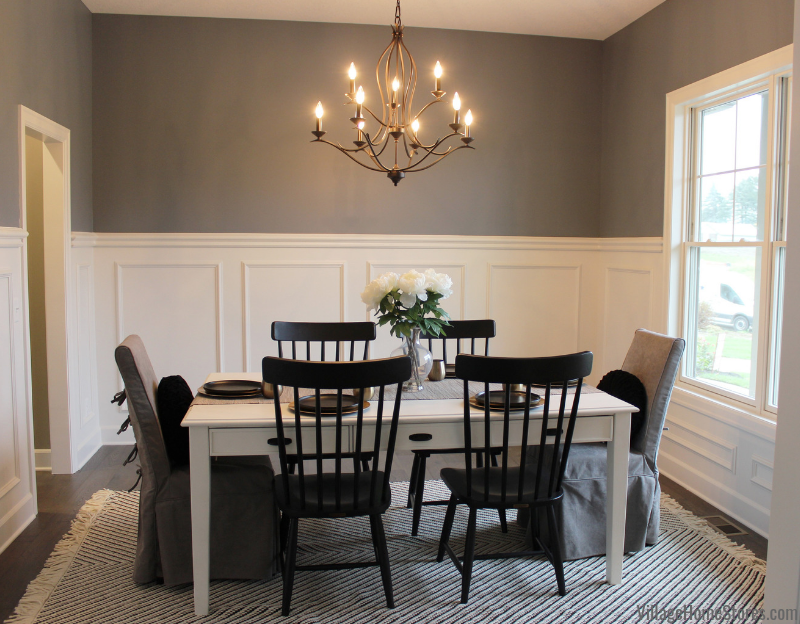 We love the light fixture selected for the formal dining room. The “Fall Flora” chandelier by Quorum looks amazing! 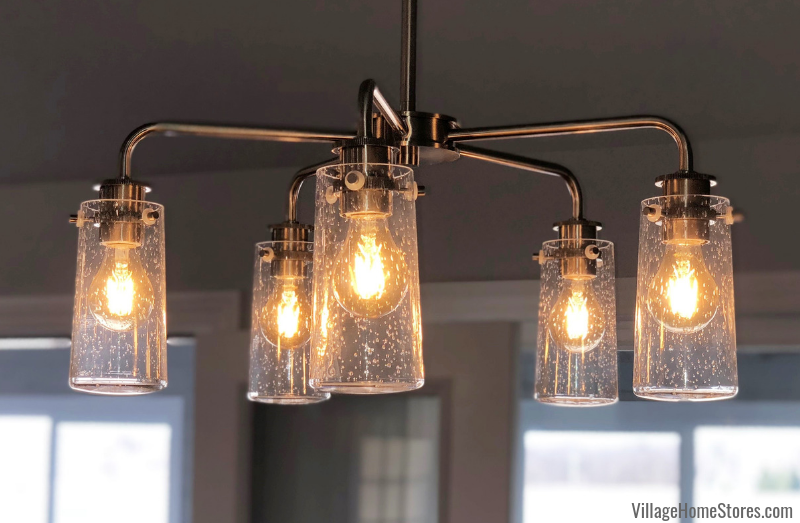 To see more lighting, bathrooms, and other spaces from this Bettendorf, Iowa home check out the full album of photos of it here on our Houzz portfolio. 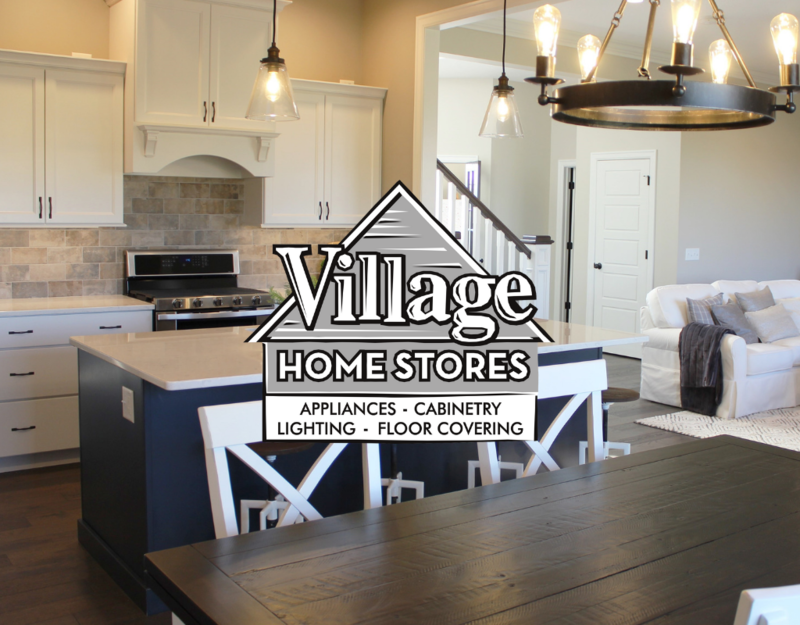 Ready to take the first steps of your own story with Village Home Stores? 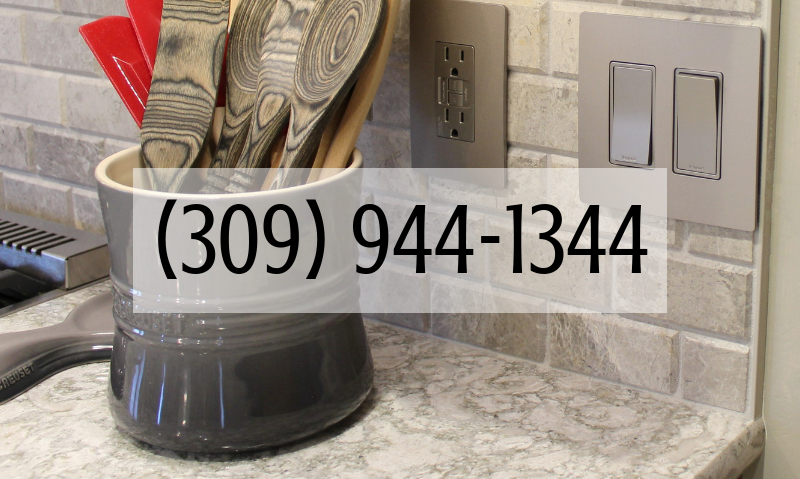 If you are building or remodeling in the Quad Cities area, we are your expert destination! We will build you a team of experts from every department you are in need of and we have a step by step process for all of the possible paths your project may take. Don’t forget that when you partner with Village Home Stores on materials for a new home, you are eligible to participate in our Bundle Program. No matter your builder, or even if you are building on your own! Purchase your complete Appliance, Cabinetry and Lighting Package from us and every $5,000 spent earns you $200 in lighting purchases. Find out more about our Lighting Bundle Info or contact a member of our team. To learn more about this home and Edgebrooke Homes visit their website here. Your first step is to reach out to tell us what you are working on. You can contact us by phone Monday-Fridays from 9am-5pm or on Saturdays from 9am-noon at (309) 944-1344. You can also complete this short form online and a member of our team will be in touch. Of course you can also stop by and see us in our award-winning showroom at 105 S State in Downtown Geneseo, IL. We do recommend making an appointment so that you can be certain to have an opportunity to meet with someone and get your questions answered. But you never need an appointment to come and look around.